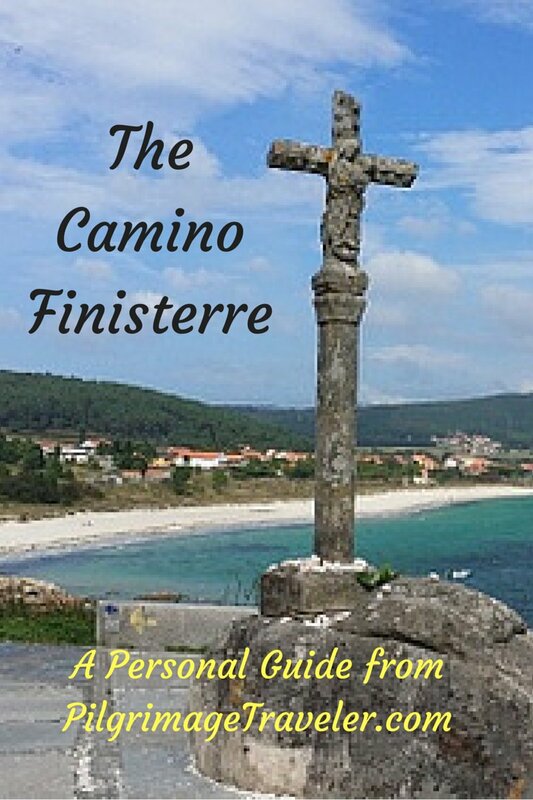 For a full introduction to the Camino Portugués, please click on the link provided, if you wish to understand how the Portuguese Camino differs from the Spanish one! 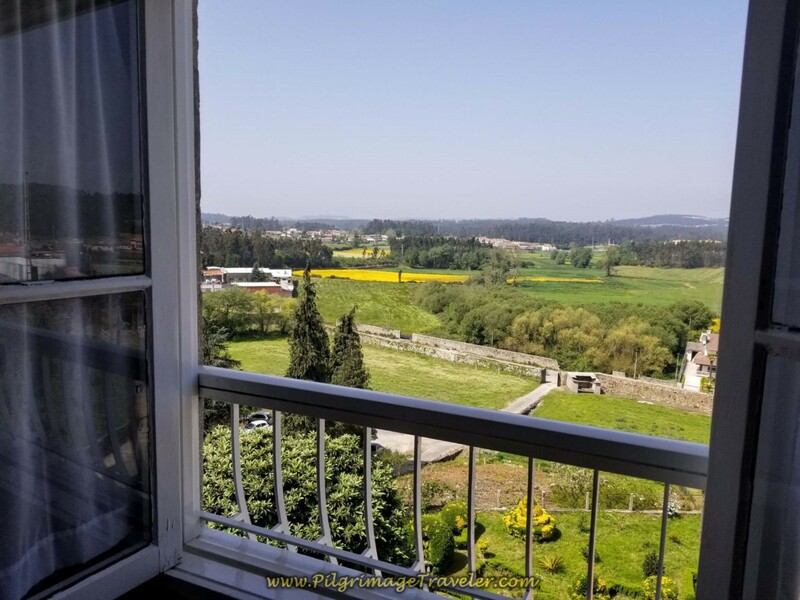 On a bright morning at the end of April we set off from our marvelous hotel in Porto, the Chateau Flores, on the Rua das Flores, in the heart of Ribeira, the center of the city. 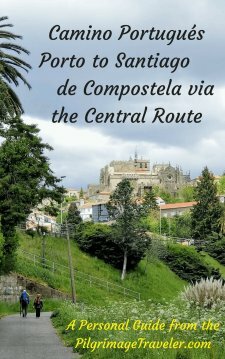 This hotel was only steps from the Camino and the Cathedral. (For more accomodations, on Booking.com click here.) 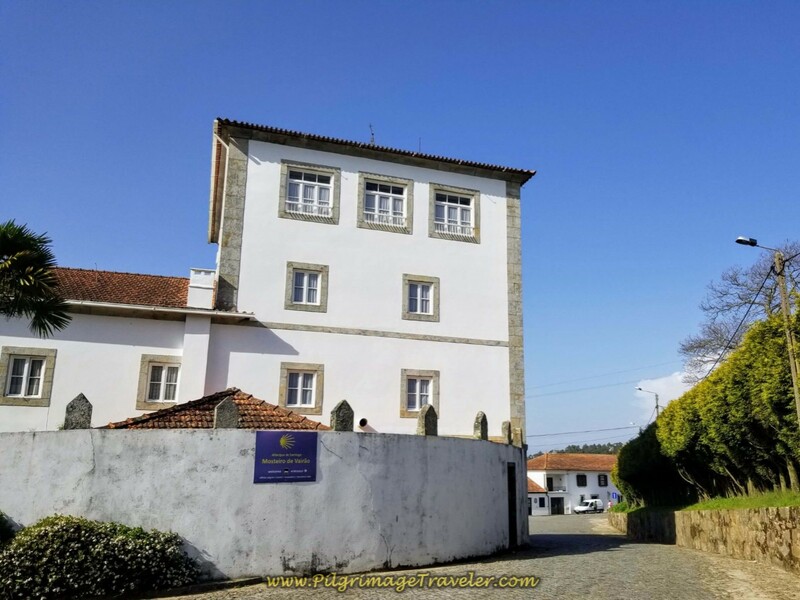 There is only one albergue in Porto, two kilometers from the cathedral, on the Camino heading north. (See our map for the exact location). Here is our Google map from the day, starting at the Cathedral Sé de Lisboa. The map was created from our GPS tracker application and denotes the actual route we took. It is an interactive map, so click at will! 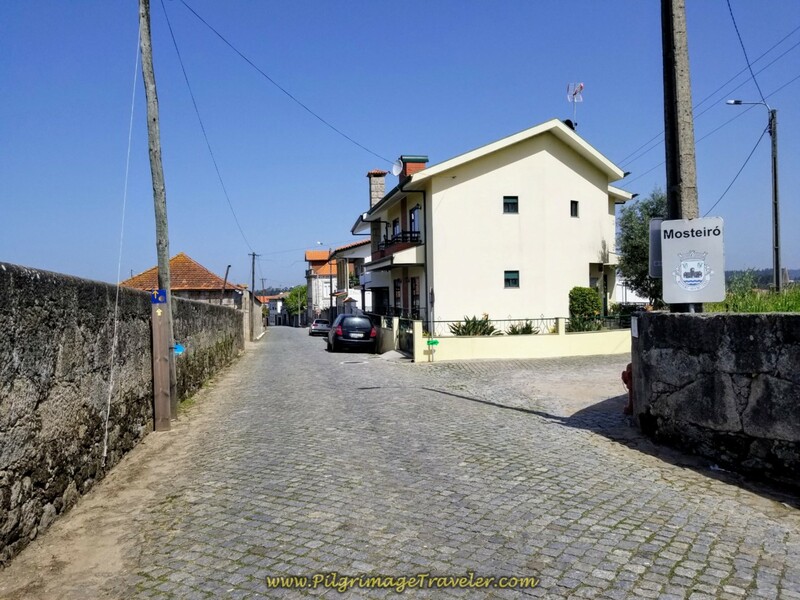 I placed the accomodations where we stayed in Porto and Vairão and additional ones in Vilarinho, plus the cafés where we stopped, for your convenience. Click on the icons to get addresses and phone numbers for the places. Don't forget to make a copy of the file from the Portuguese Via Lusitana showing a list of albergues only, for the Central Route. Here is the elevation profile of the first 500 meters of the walk from the Cathedral in Porto, to our hotel, that I recorded the night before. 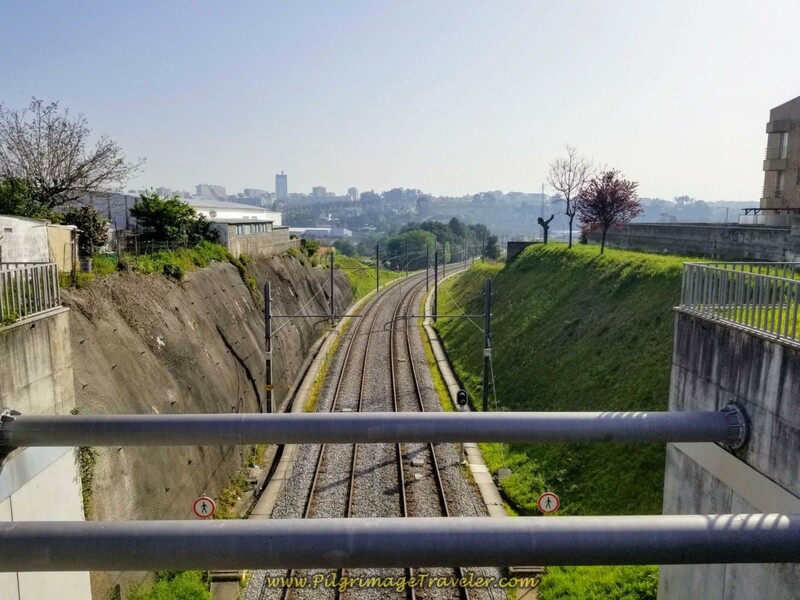 It is straight down the hill, essentially, then, as the elevation profile shows below, a climb back up from the city center, a loss of 28 meters in a short distance! Here is the rest of the day, 25.5 kilometers full of ups and downs, with 341 meters of vertical ascent (about 1118 feet). 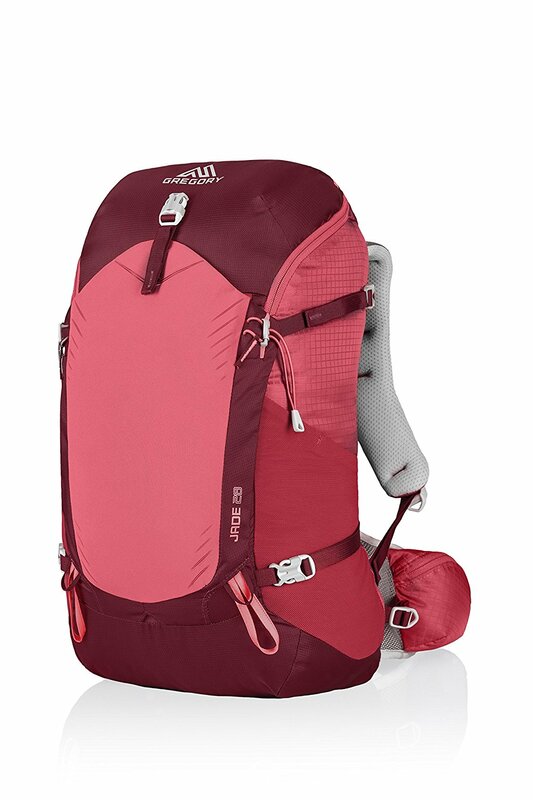 Because of all the elevation changes, the day will feel like an industrious one, especially if it is your first day. It did to us. Fortunately, there is a descent on the final steps of the day. This first day of our Camino, and as the above quote suggests, would be a day of gathering. We just didn't know it when we set out! 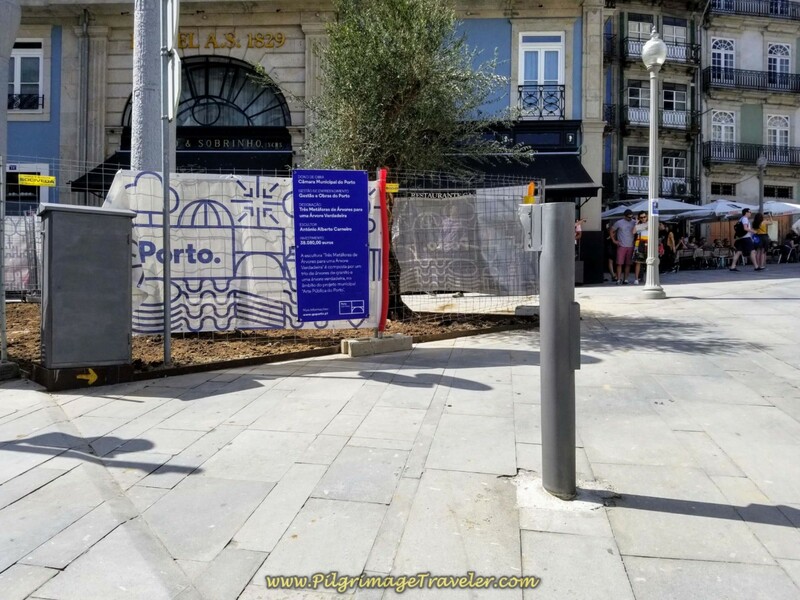 You may first want to familiarize yourself with the city of Porto, and all it has to offer, by clicking on the link. 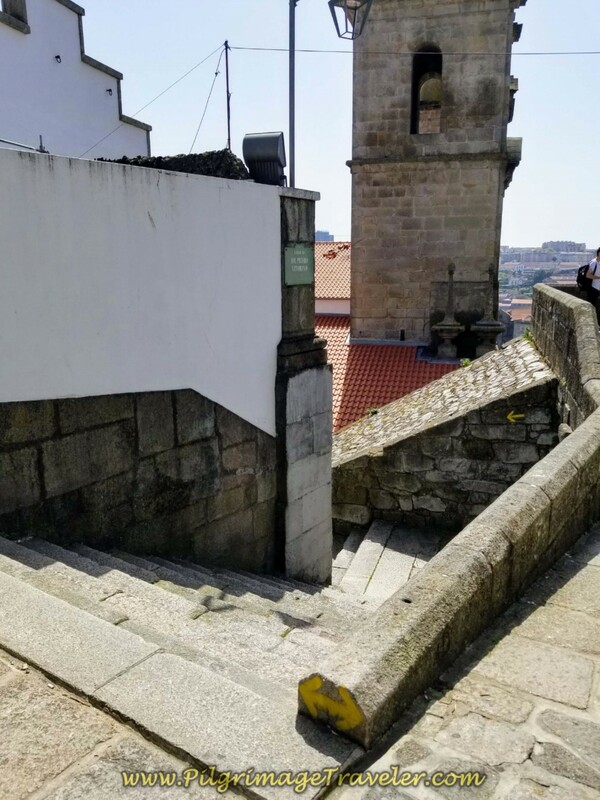 Finding your way out of Porto on the Central Route is a bit tricky on the initial steps from the Cathedral, but then later, it is quite well-marked with yellow arrows, and also metal tiles right on the pavement (see farther below). 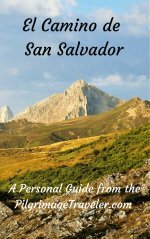 My description of the route is for your familiarization beforehand, but is not entirely necessary to use as you walk along. 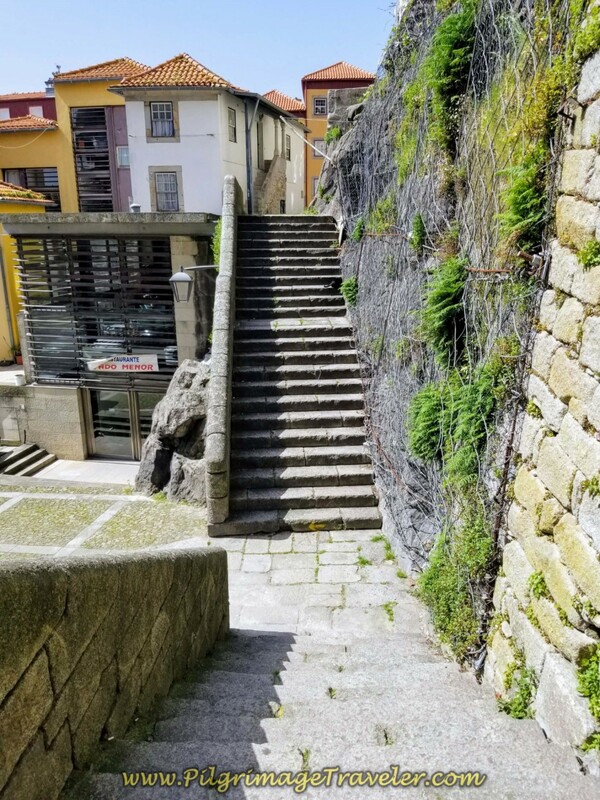 Immediately across from the front of the Sé do Porto, you will see a ramp leading you down to the plaza below. On either side of the ramp, at the very top, you can see the first arrows of the Central Route. Below is Rich and I at these first arrows. 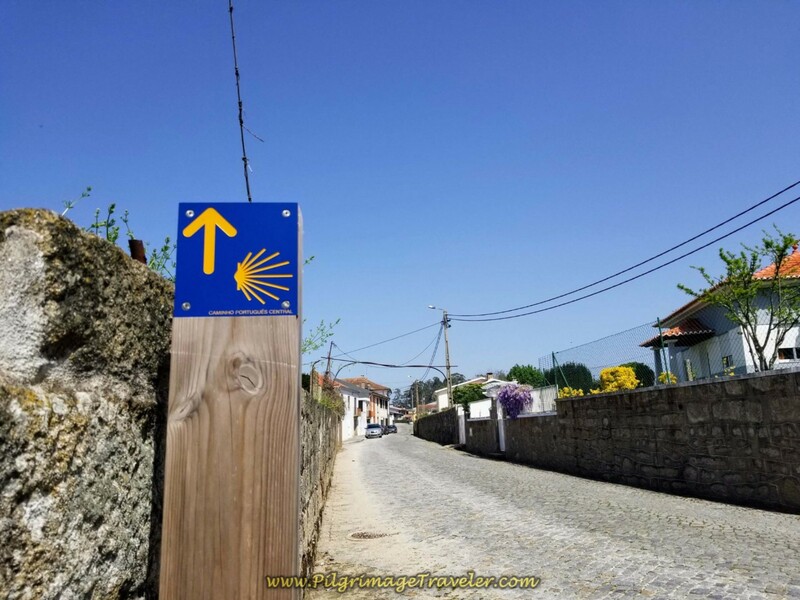 The yellow arrows are towards Santiago de Compostela, the blue in the opposite direction for the pilgrimage to Fátima. 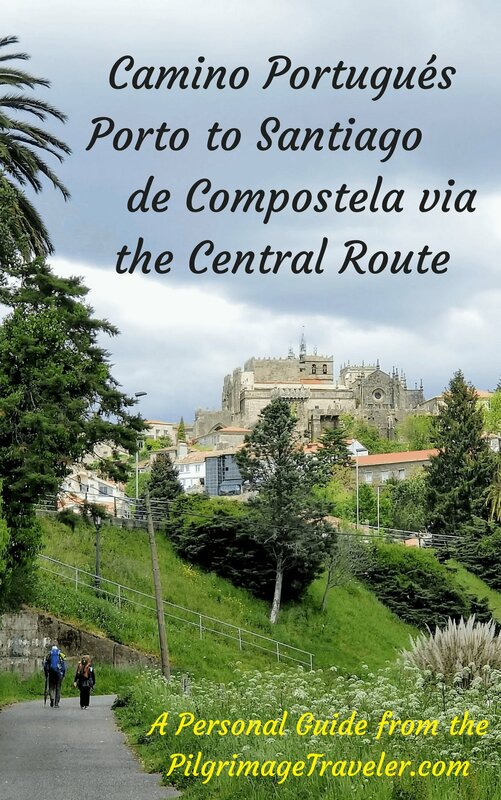 To start day fifteen of the Central Route on the Camino Portugués, proceed west, down the Cathedral ramp, turning left at the end, by the Pelican Fountain (Chafariz do Pelicano), just below the cathedral terrace wall. (See Porto for a photo of this fountain). You will see a look-out on your right. Proceed towards the lookout. Pause here to take in the spectacular view! Find a set of stairs leading down to the left in front of the lookout terrace. 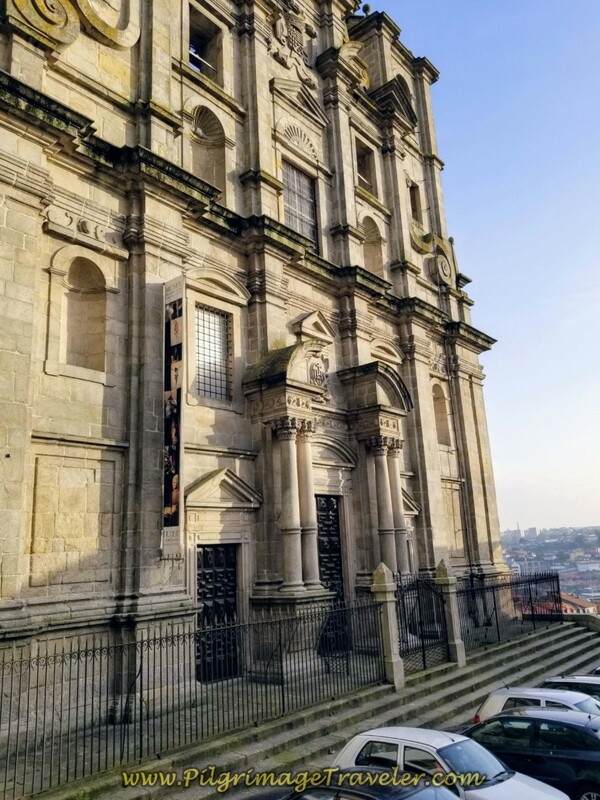 You can see the towers of the Igreja de São Lourenço looming above you. The yellow arrows at the top of the stairs indicate that you can go either direction, but it is more direct to go left and down the stairs, all the way to the Colégio Square, below. The square is filled with the presence of the Church of St. Laurence, below. 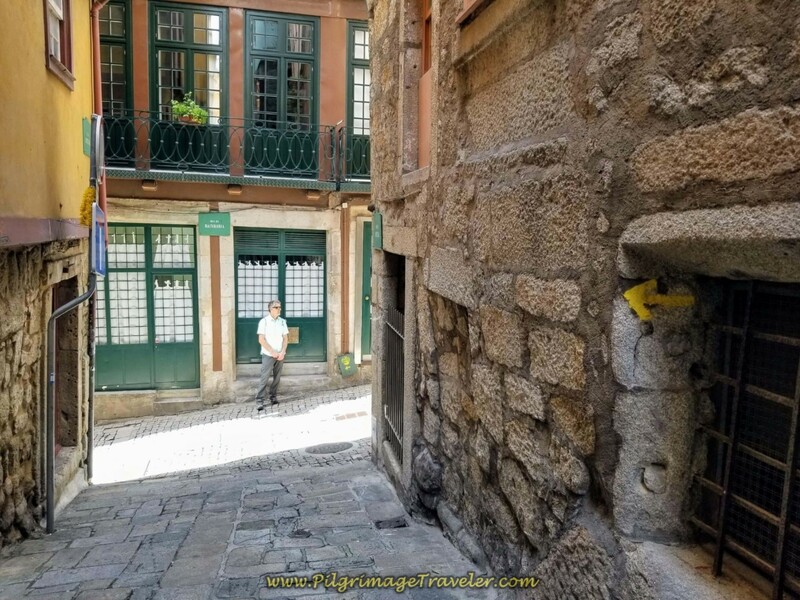 Igreja de São Lourenço / "Grilos"
Proceed across this square to the buildings in front of you and you will see the yellow arrow leading you down the Rua de Santana, shown below. 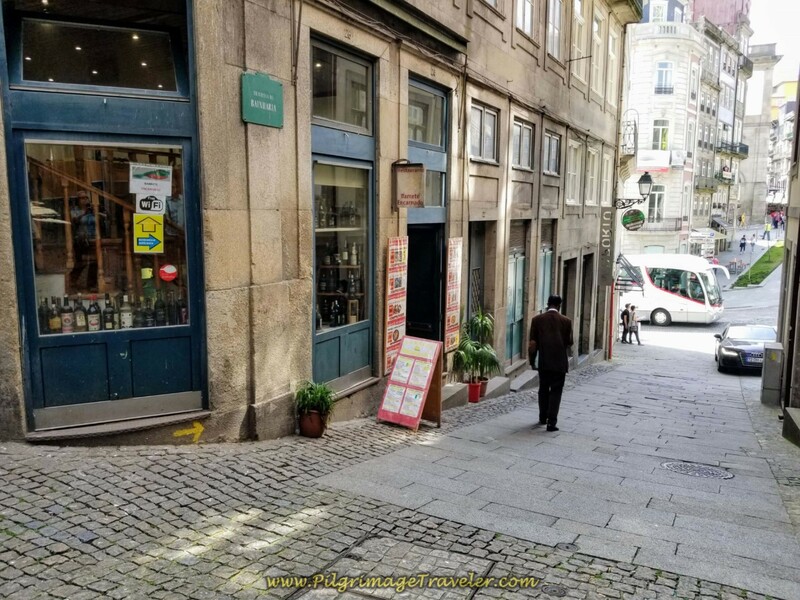 Rich is standing where the Rua de Santana intersects after approximately hundred meters with the Rua de Bainharia, above. 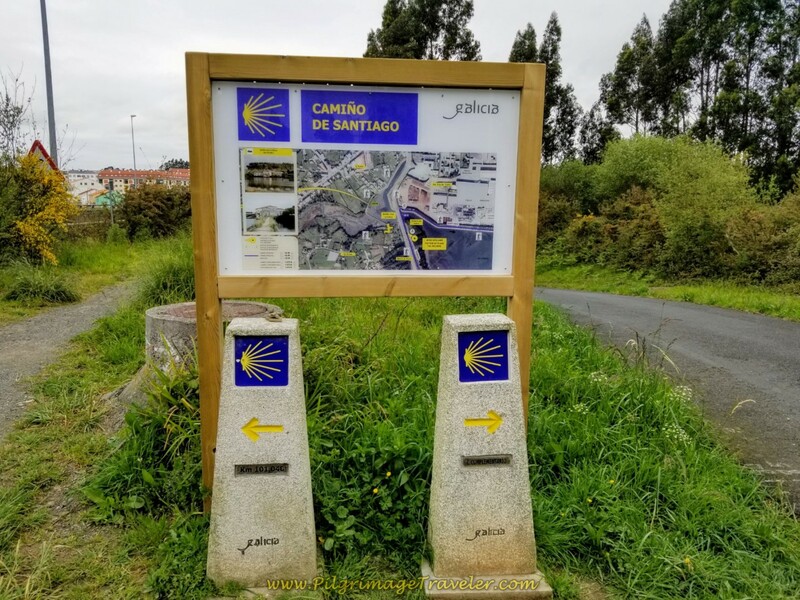 The Camino goes left. After only a few steps more, the yellow arrow directs you to the right and onto the Travessa de Bainharia, shown below. 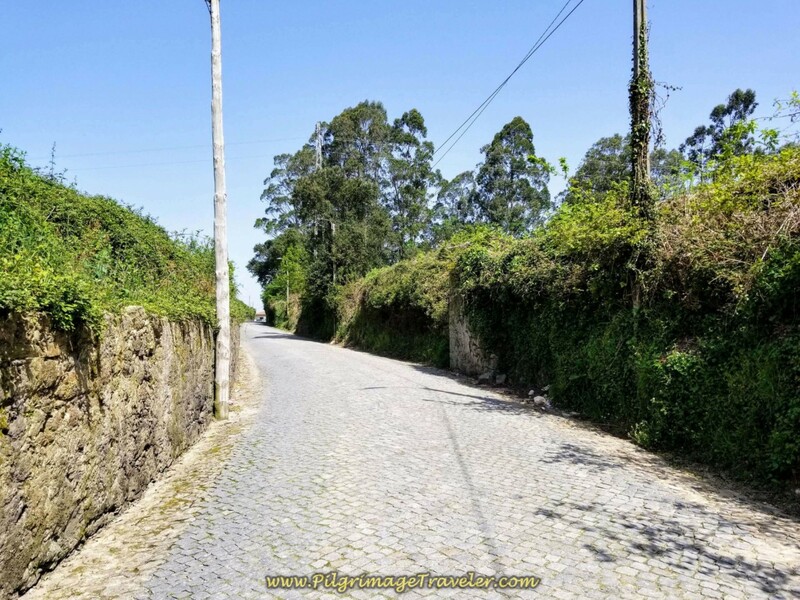 The Travessa brings you to the bottom of the hill and after only about another 100 meters, the Camino turns right onto the Rua das Flores, the famous tourist pedestrian way, below left. 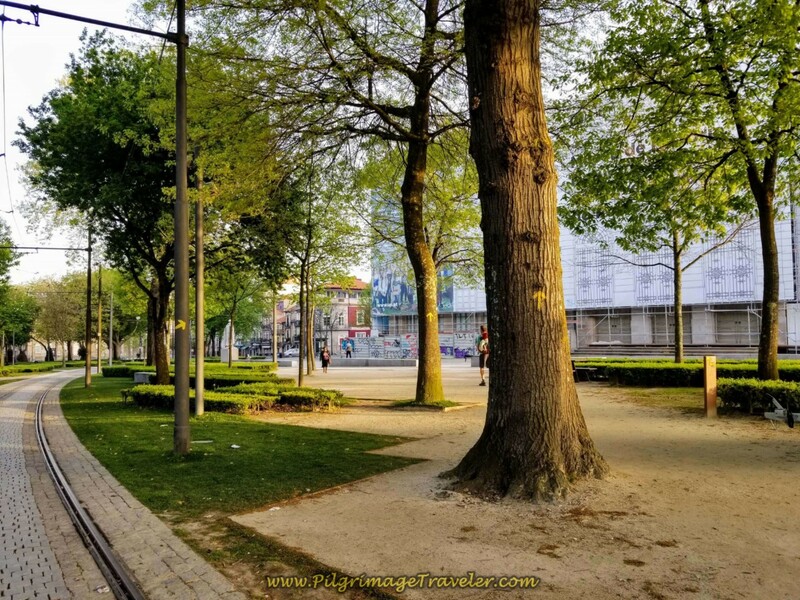 Most likely, if you are leaving in the early morning from the Cathedral, this pedestrian way will look like a ghost town, with all the open-air cafés being closed up. 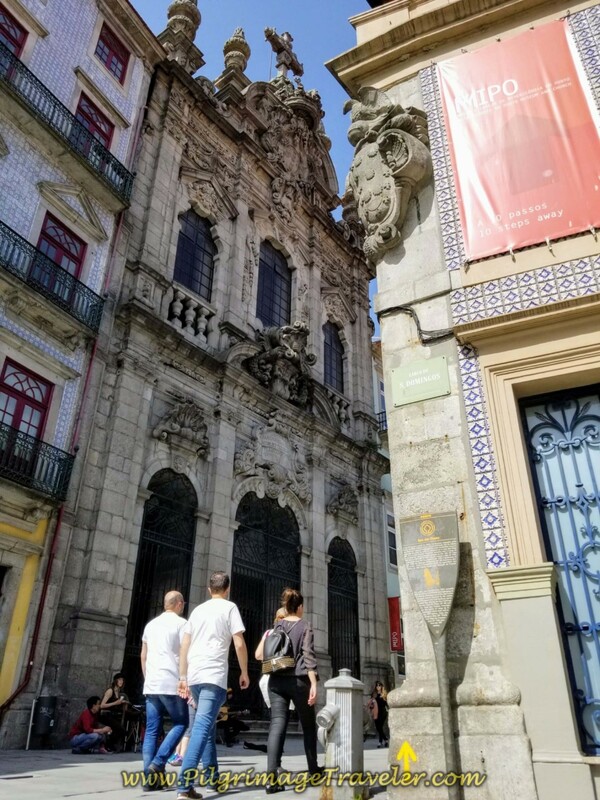 Continue on by the Igreja da Misericórdia which is now a museum. 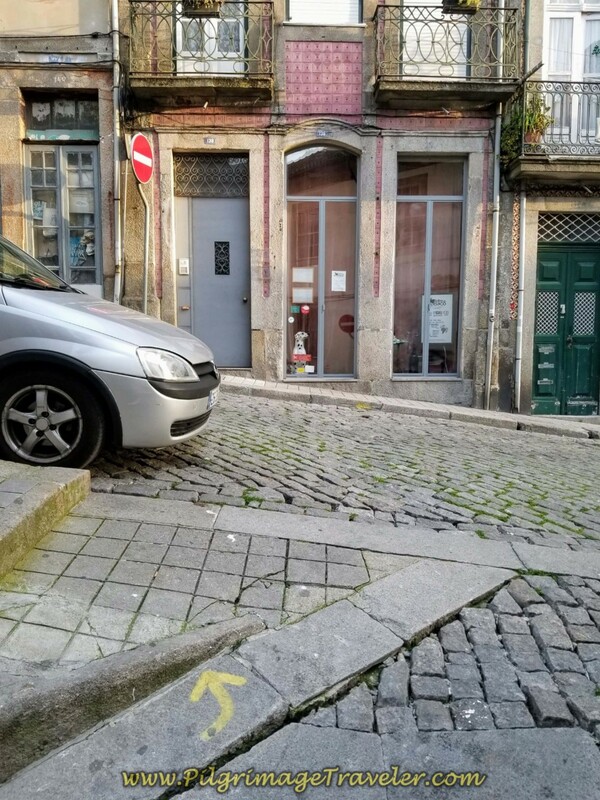 After about 170 meters, look closely for the left turn up the narrow Rua do Ferraz, shown below. You can see that when we walked the building behind it was under construction, and it was difficult for us to see the yellow arrow from the pedestrian street. 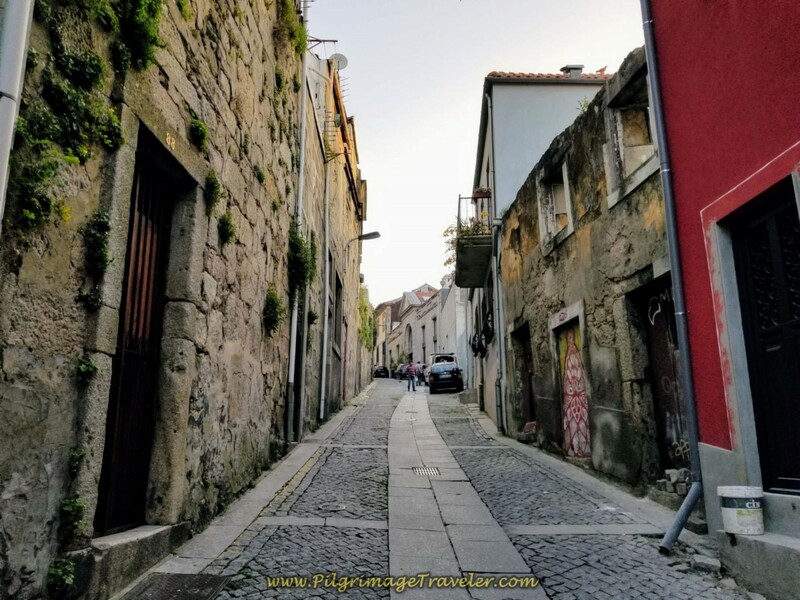 A few short steps later the narrow Rua do Ferraz ends and the Camino turns right onto the Rua da Vitória and continues to climb up the hill, below. 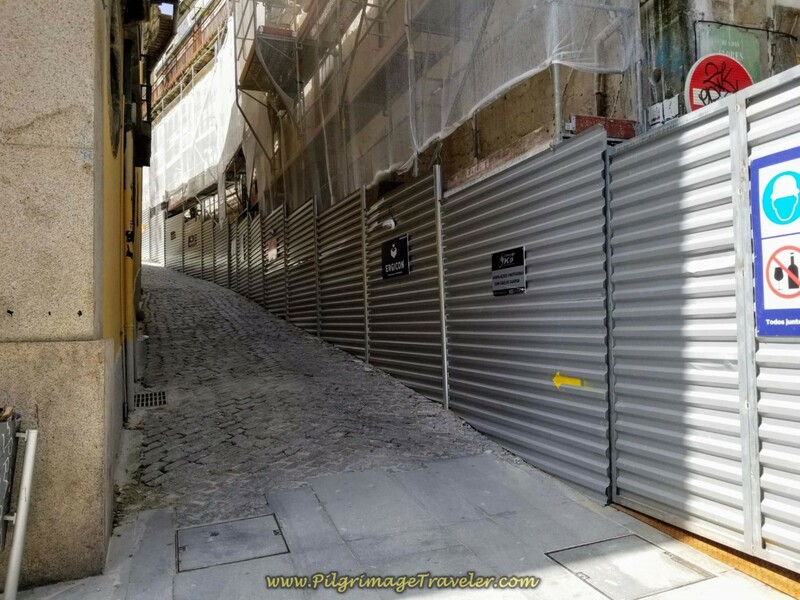 Again, a few steps later, the narrow Rua da Vitória ends, and the Camino climbs now to the left on the Rua dos Caldeireiros, photo below left. 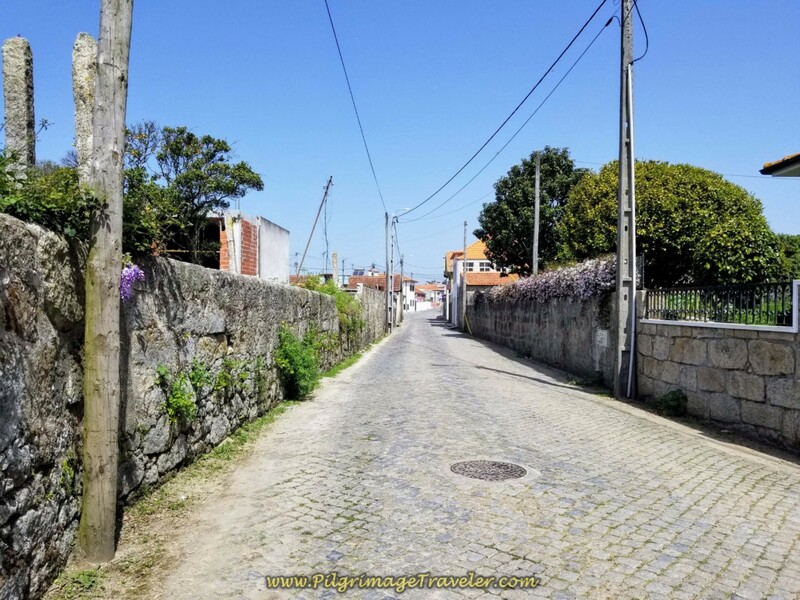 Continue up the hill toward the large square called the Largo Amor de Perdição, below right. 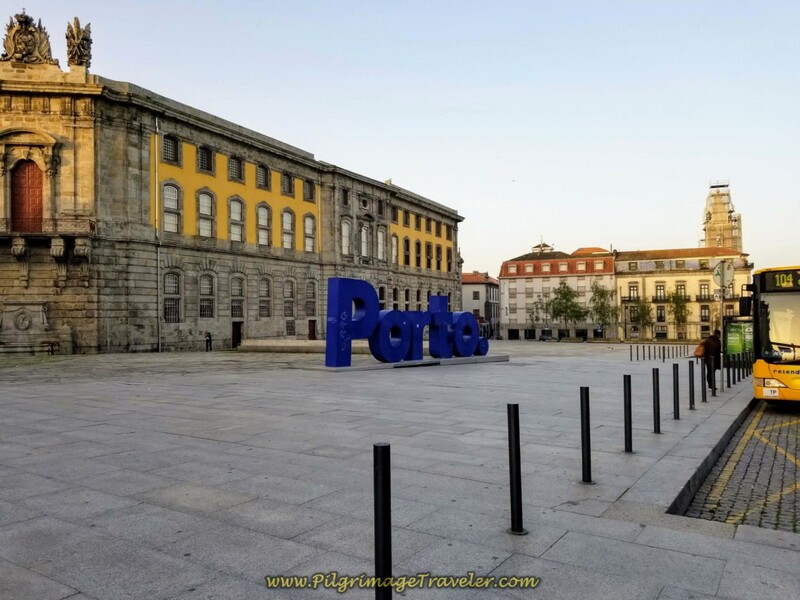 This street leads you to this large tourist square, with the famous Clérigos Tower on your right (See article on Porto), the open square to your left with the large Porto blue letters and the park and University of Porto straight ahead. Walk to the east of the square, cross the street in front of you, see below photo, and head through the park, following the now-prolific yellow arrows on the trees. 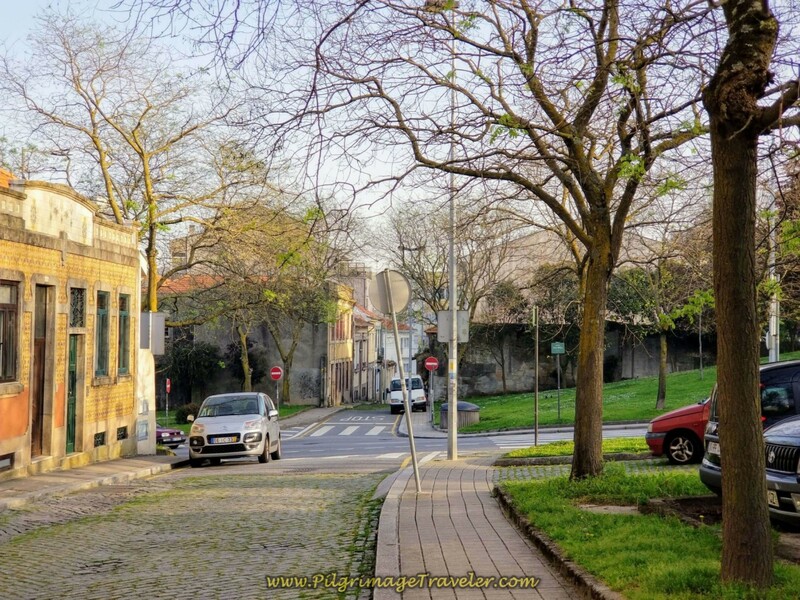 Walk through the park called the Jardim da Cordoaria, by the University of Porto on your right, below. 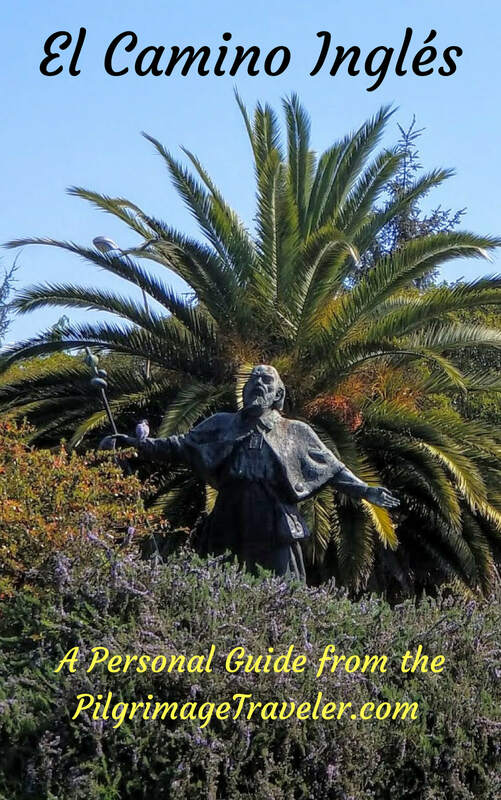 Passing the University building on the west side, come to another open plaza, the Praça de Gomes Teixeira and the Lions Fountain. 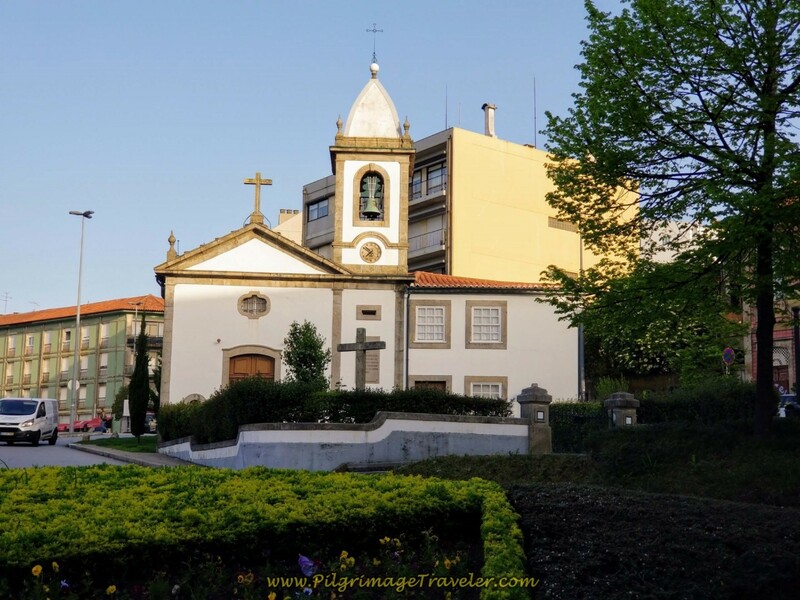 The twin churches now loom in front of you, the Igreja dos Carmelitas Descalços on the left and the Igreja do Carmo on the right. 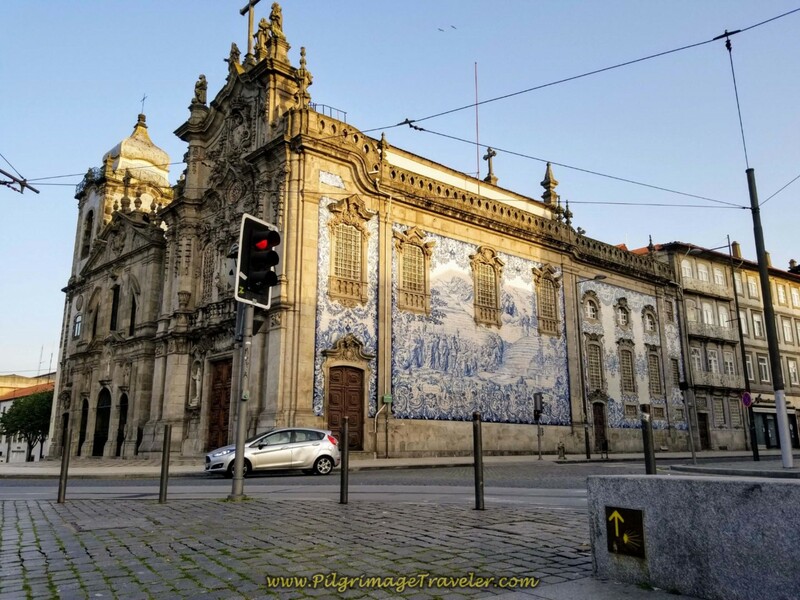 The azulejo tiles on the side are fabulous if you haven't already seen them on your tour of Porto. 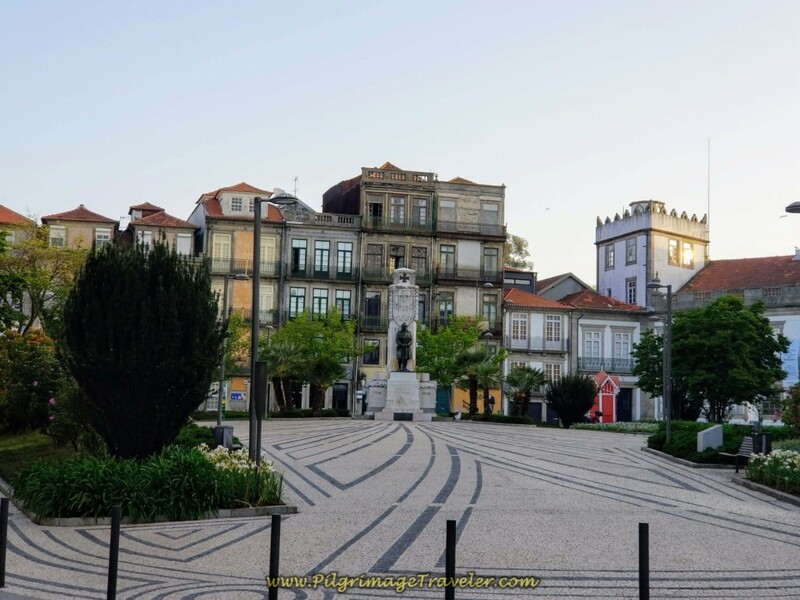 This famous square is a lovely place to hang out on a sunny day before your Camino! 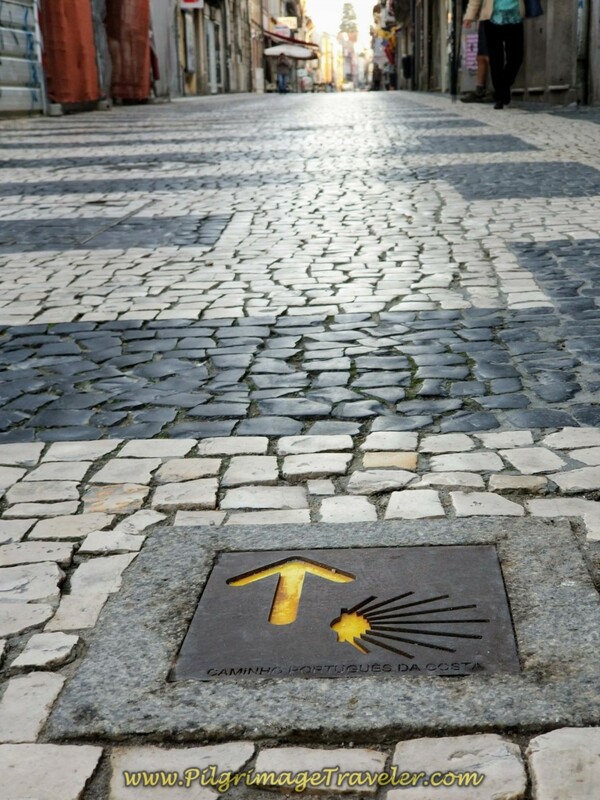 Follow the waymark straight on past the twin churches to the right and in a few more steps encounter the next plaza and statue of Praça de Carlos Alberto. Turn left here. We had trouble finding the yellow arrow by this plaza. 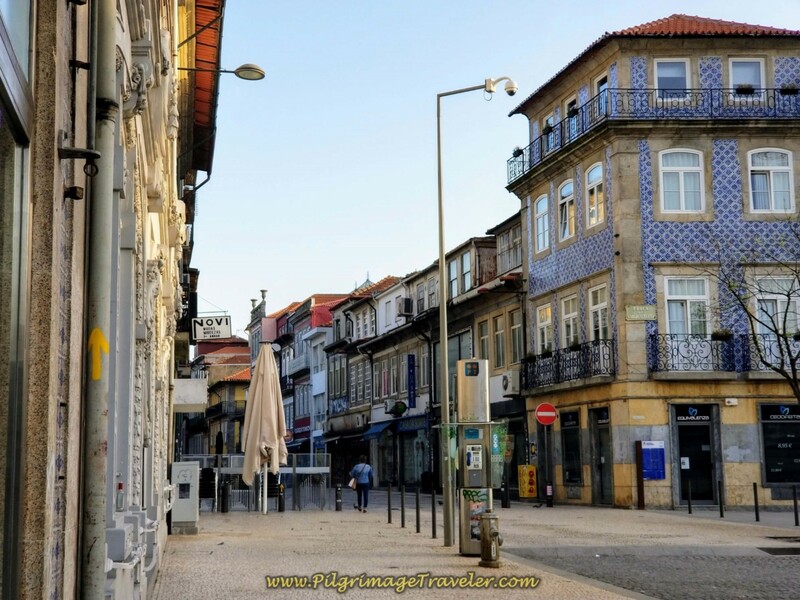 Within a few more steps, enter the lovely walking street and shopping area of the Rua de Cedofeita, below photo. This lovely pedestrian way continues for over 300 meters and creates a nice diversion while you walk it. Along this section, as you would expect in a large city, there are lots of open cafés if you need to find coffee and breakfast. (In Portuguese the word for coffee is café and coffee with milk is café con leite). Since the Chateau Flores had a kitchen, we prepared our own breakfast that we had purchased at the grocery store the day before so we did not stop. Continue straight on the Rua de Cedofeita, which is well marked, see photo to the left, and until it is no longer a walking street. Come to the intersection in the photo below. 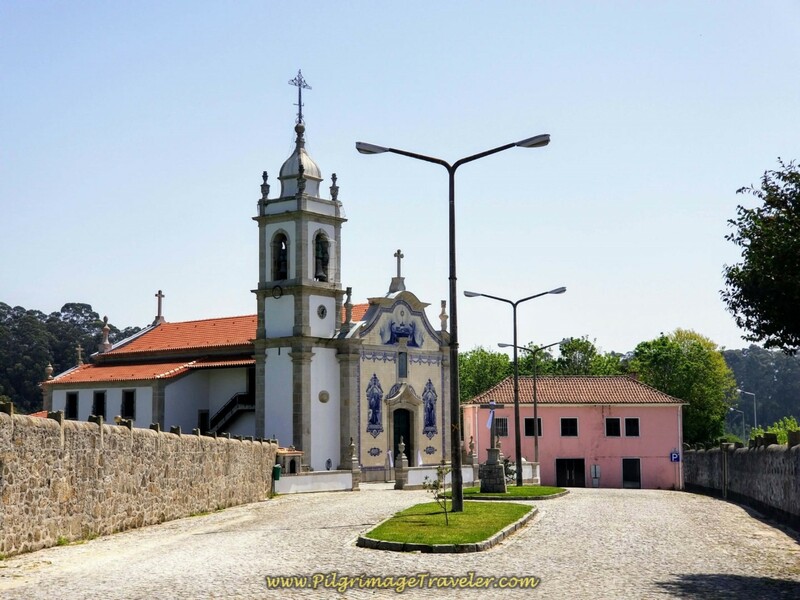 Here you can take a short diversion left to see the Church of São Martinho de Cedofeita, if you so desire. It is a Romanesque Church originally began in the 11th century and quite well-preserved (not pictured). 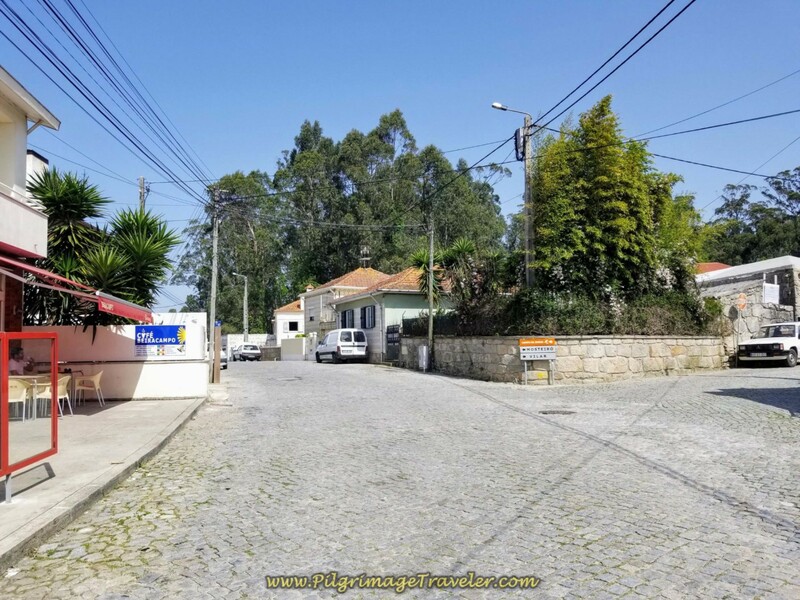 The street changes its name here from the Rua de Cedofeita to the Rua do Barão de Forrester and takes you to the next landmark, the Capela da Ramada Alta. 30 meters, just before this Chapel, is the Albergue de Peregrinos Porto, the only albergue in the city itself, (see location on our map above). 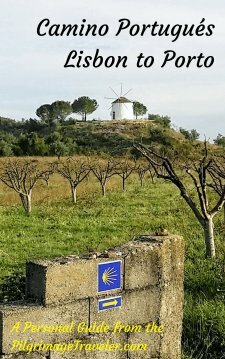 It is a new place, built in 2016 and looks quite lovely, right along the Camino. Plus, they will take reservations through the link I provided. 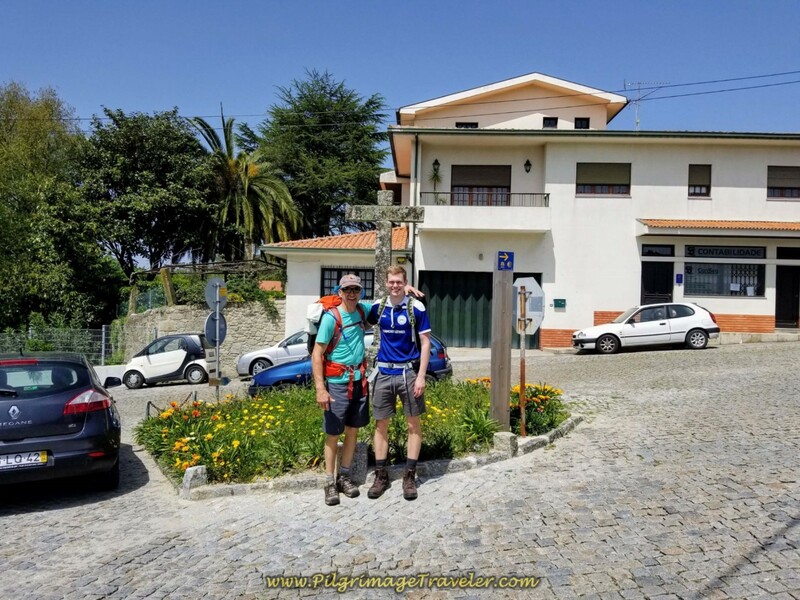 This albergue is about two km from the start of day fifteen on the Central Route of the Camino Portugués. Turn left at the Chapel and go around the back and through its square. 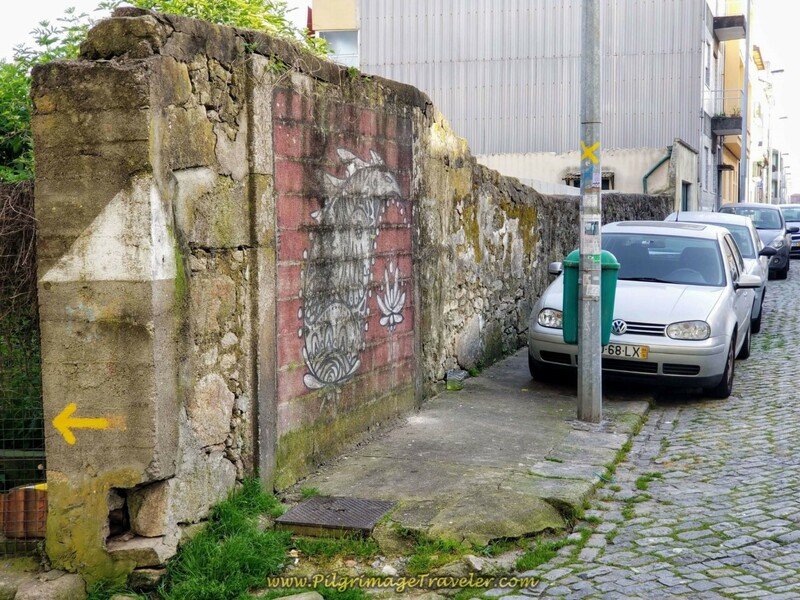 Pick up the next side street to the right, the Rua de 9 de Julho. Keep following this small street as it bends right and left. This diagonal side street is well-marked as you can see in the photo, below. The yellow X on the pole means, "Don't go this way!" 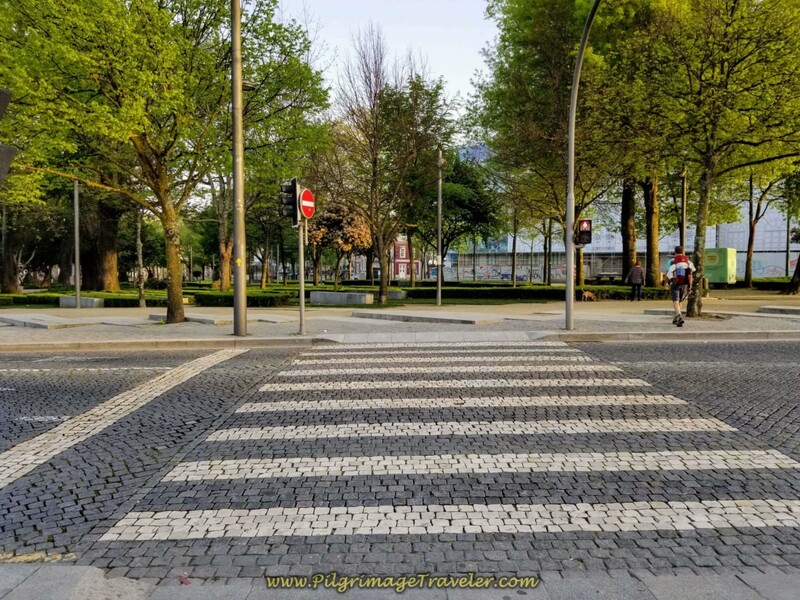 The diagonal side street eventually joins the Praça do Exército Libertador, bending to the right. 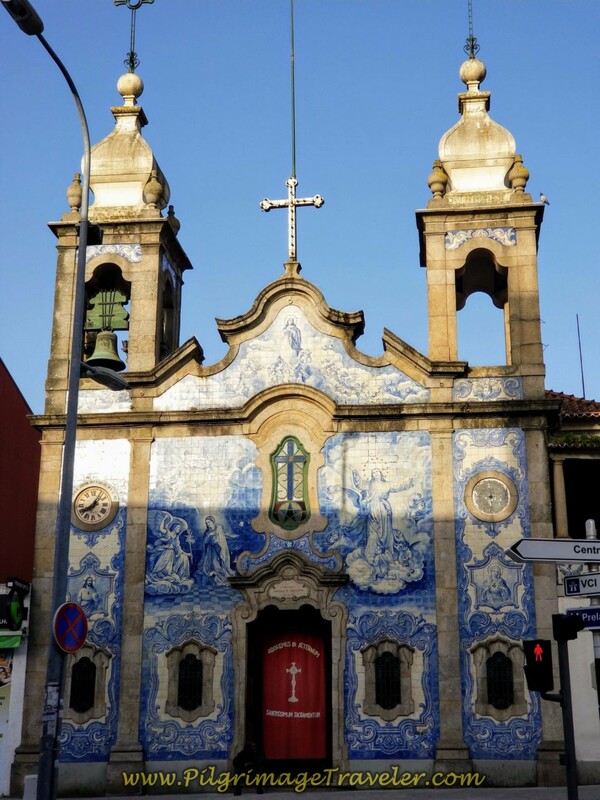 This street passes the gorgeous Igreja Paroquial do Carvalhido. 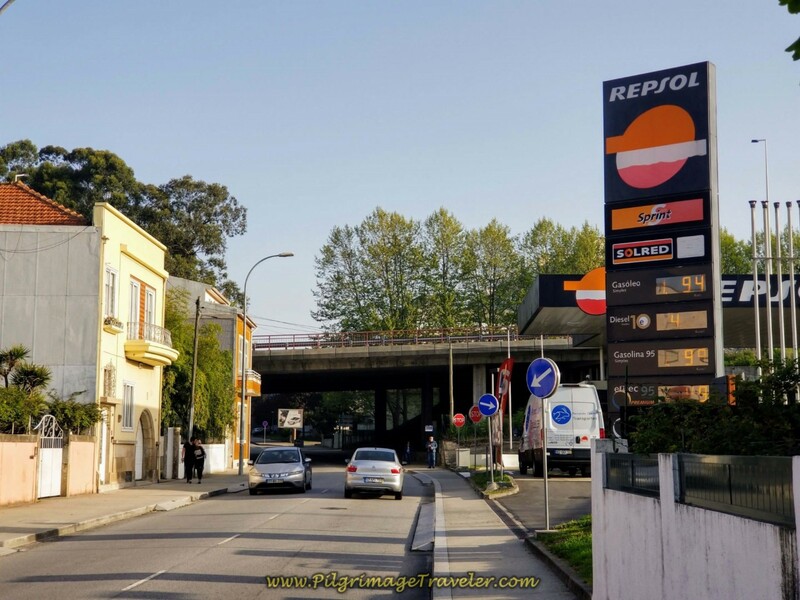 You know you are on the right track when farther on you see the Repsol gas station, and the overpass to the A20 highway. 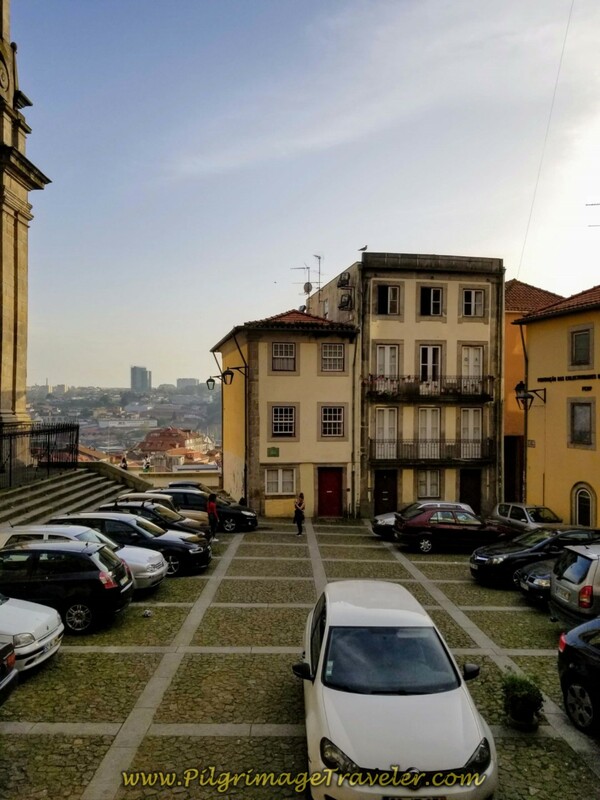 Congratulations, you have now left the center of Porto. 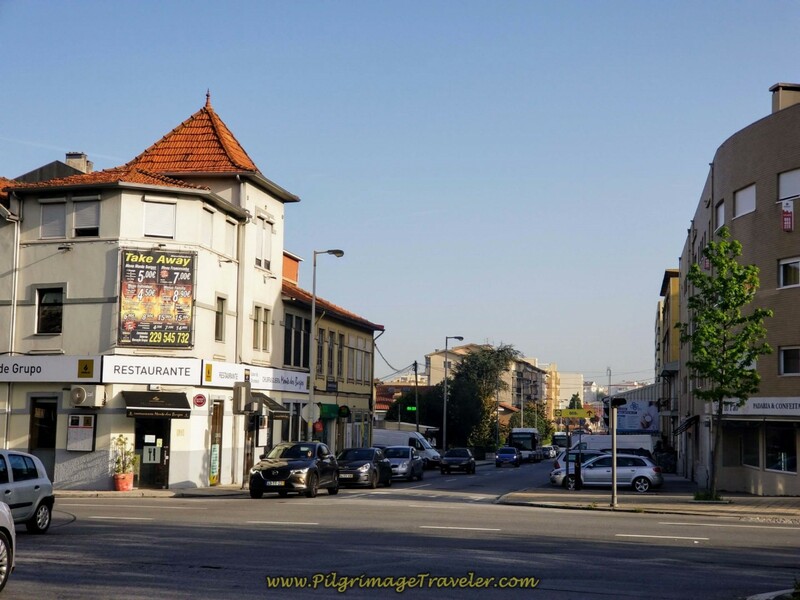 Continuing along the street, now called the Rua do Monte dos Burgos, we come to the intersection of the N12. In about 1/2 km farther on, walk by the Lidl supermarket. If you need supplies, here is your opportunity. 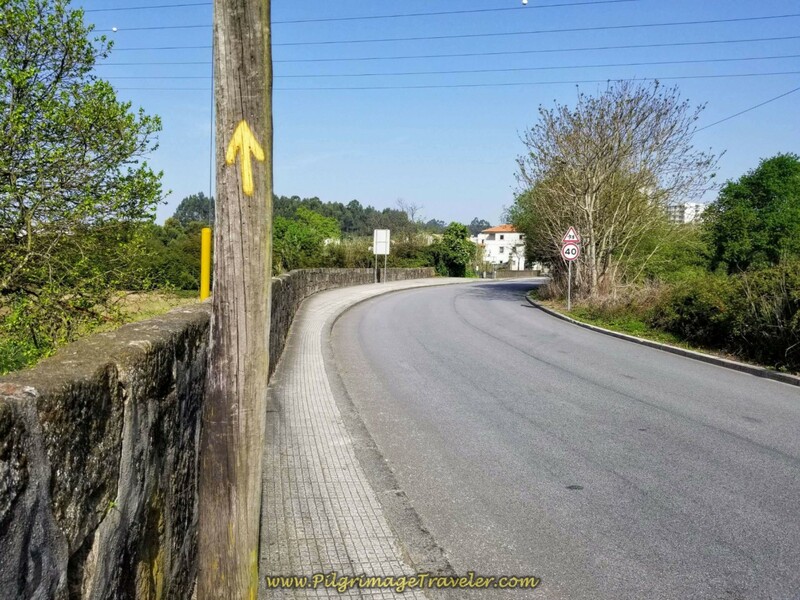 In 6.9 kilometers, according to my GPS, and after walking about 1.5 hours, we came upon the the division of the Camino, designated by the signpost pictured below. The Central Route continues onward here, and the Coastal Route veers off to the left. 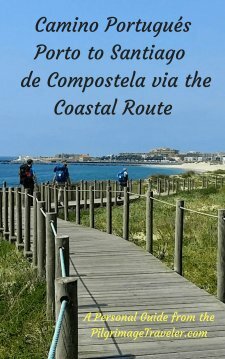 If you were planning to walk the Coastal Route, here is where you turn. 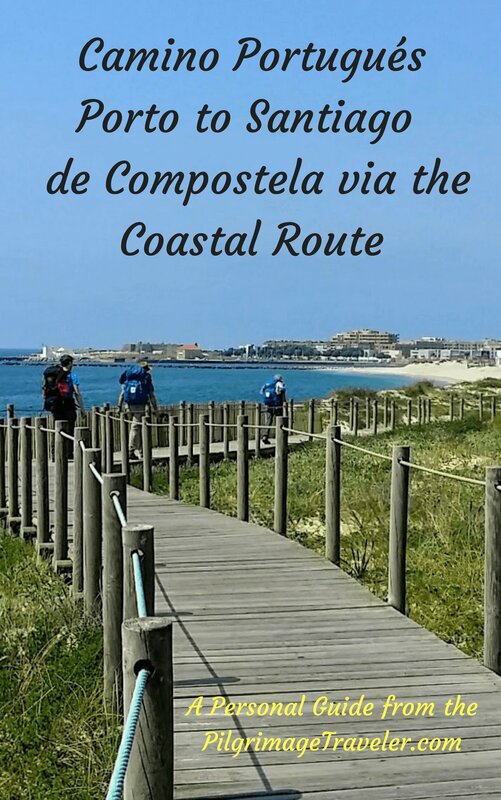 This signpost was difficult to see due to the construction all around it, so stay alert if you want to take the Coastal route. 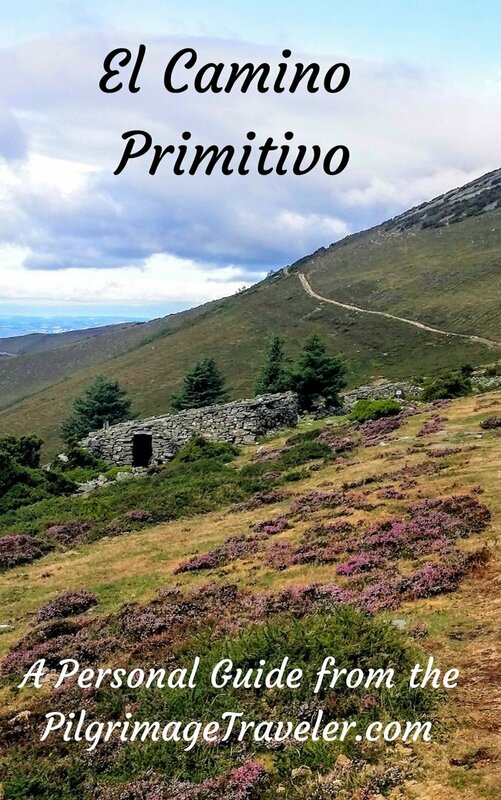 After this division of the Camino, there is a long, lovely downhill paved section, seen on the elevation profile above as the first long downhill. 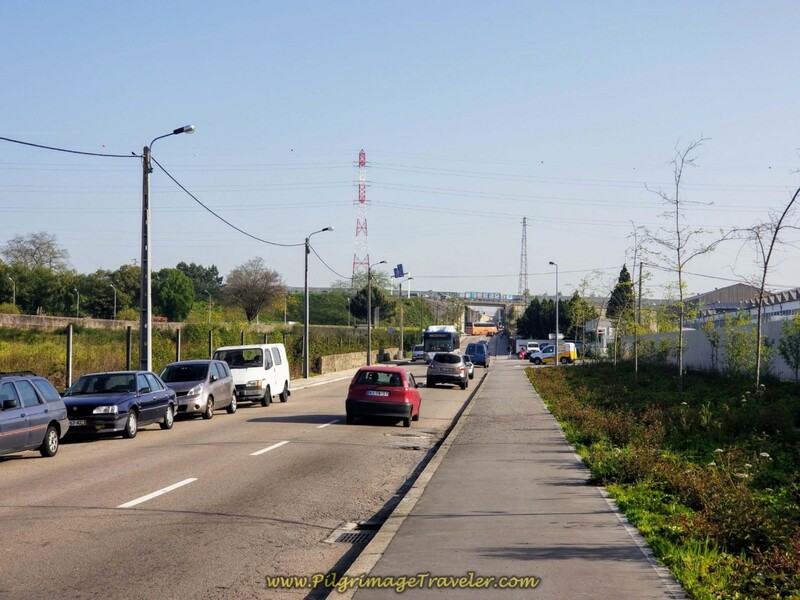 There is a flat, open long stretch of highway on the Rua de Recarei crossing under the A4, shown below. 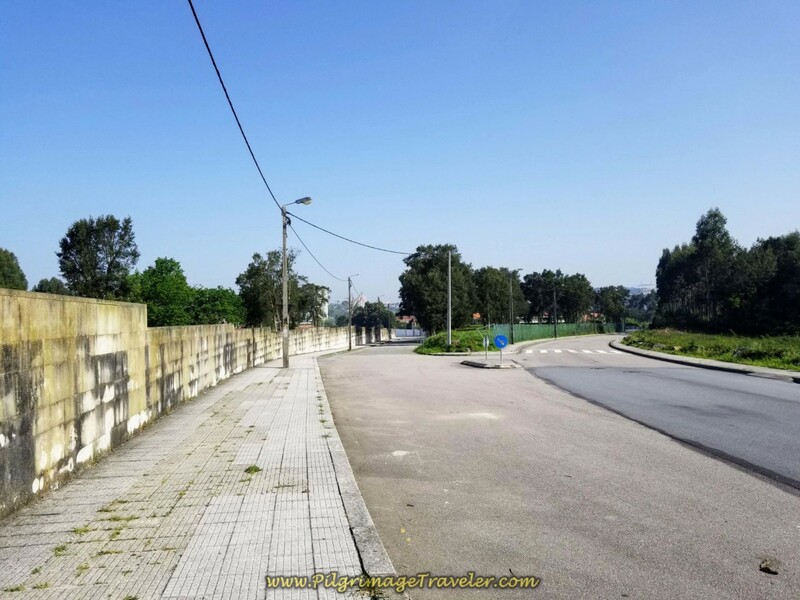 After walking under the A4 you enter the towns of Leça de Balio and Araújo, which have many open cafés at about 9.0 kilometers into the walk. We stopped at the Café Brasil, the first one we came to, for our first coffee break of the day. 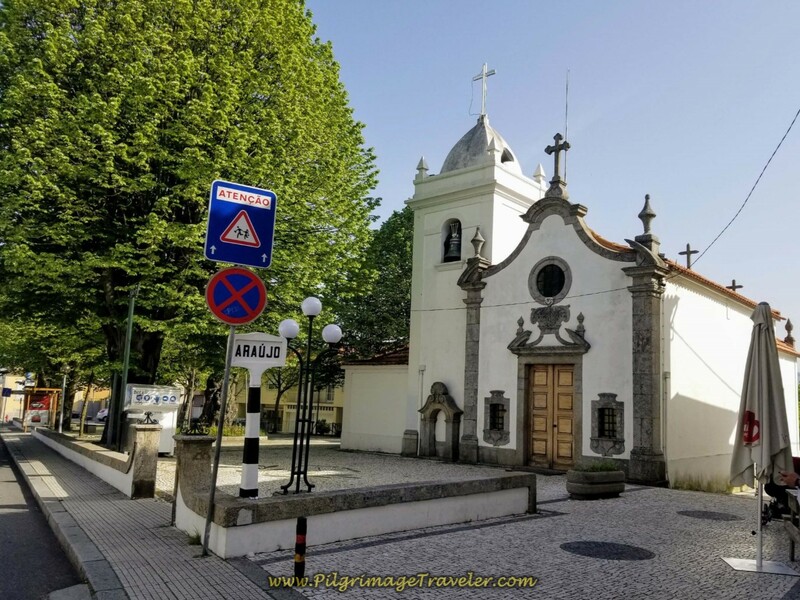 A really nice stop is the cafê by the Igreja de Araújo, at 10 km, with a nice secluded area with trees and a grotto in a gnarly old tree. Wished we had seen this spot first! After leaving Araújo, the Camino crosses the tracks where there is a metro station at Custió, if needed. 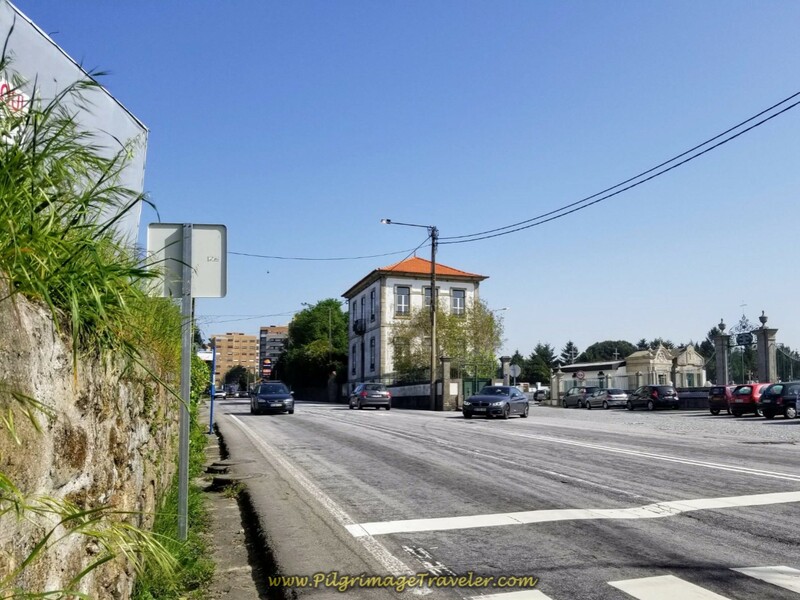 Follow the main street until you are directed left onto the Rua Ponte de Moreira, photo below. You are now entering the town of Moreira. and then cross the A41, to begin the second climb of the day. 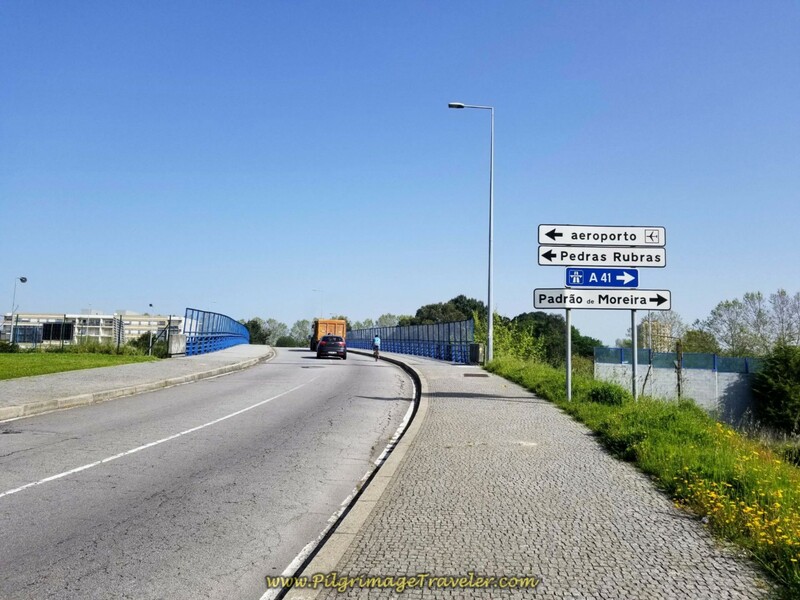 Come to a T-intersection and turn right onto the N107 (Avenida do Aeroporto), coming from the airport to Moreira. 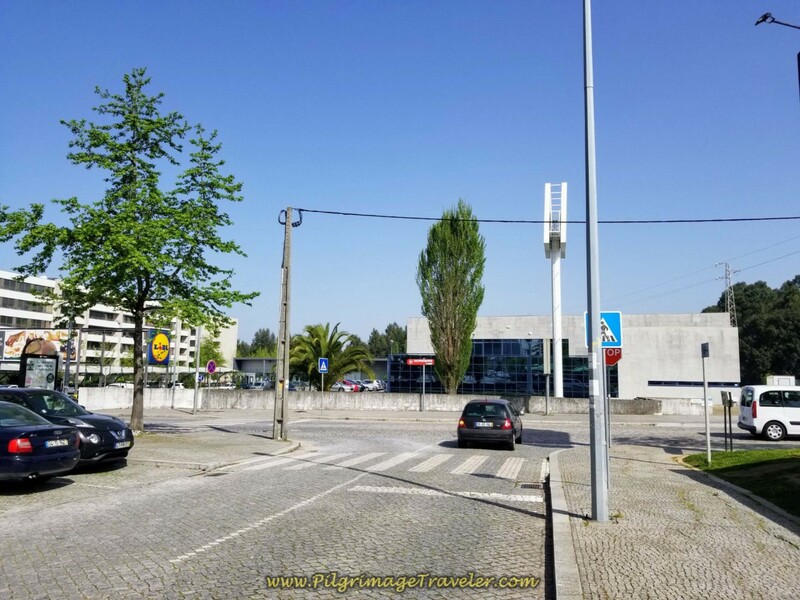 The Porto airport is just to the west of you here, and some pilgrims chose to walk their first day directly from the airport, missing Porto altogether. Follow the N107 to a roundabout, staying left and joining the N13 briefly. 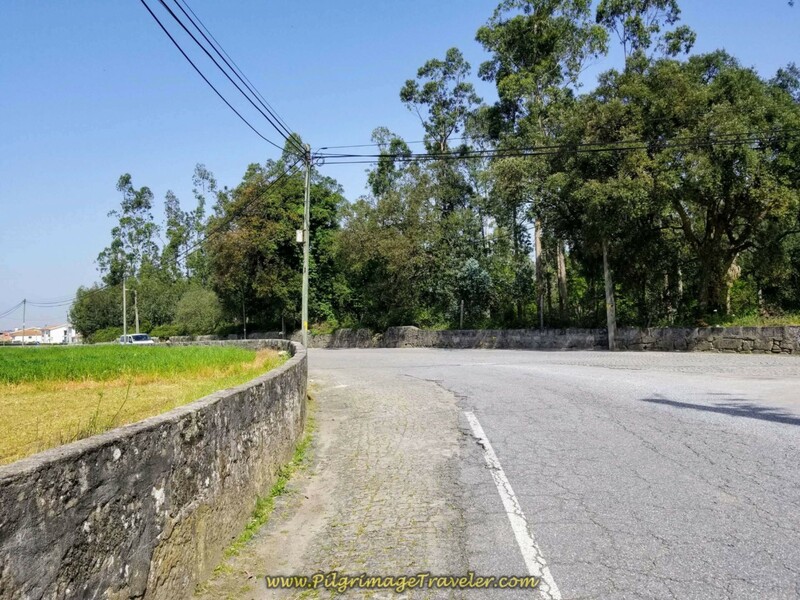 The Camino turns off the N13 highway, below at the pictured intersection and onto the Rua Monte Clara, by the chapel and large cemetery of Moreira which you can vaguely see in the right of the photo. 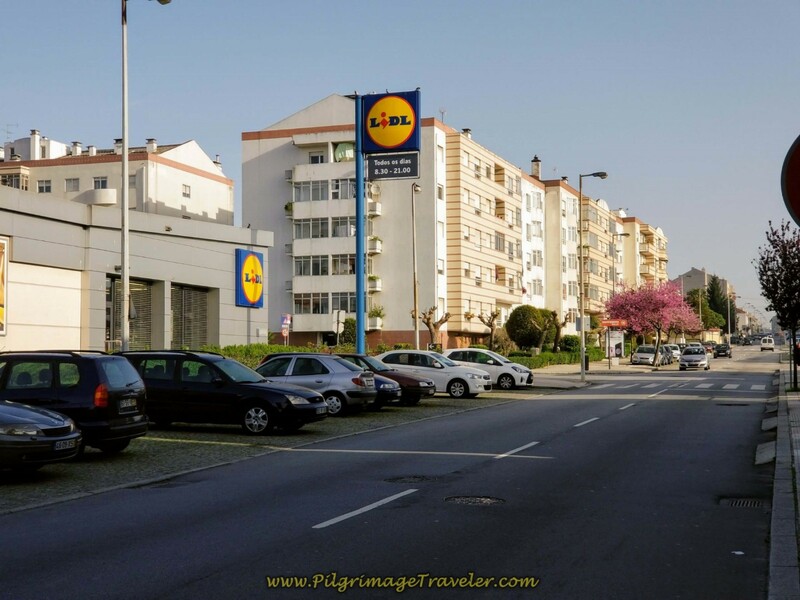 ...bringing you out to another Lidl supermarket, pictured below. 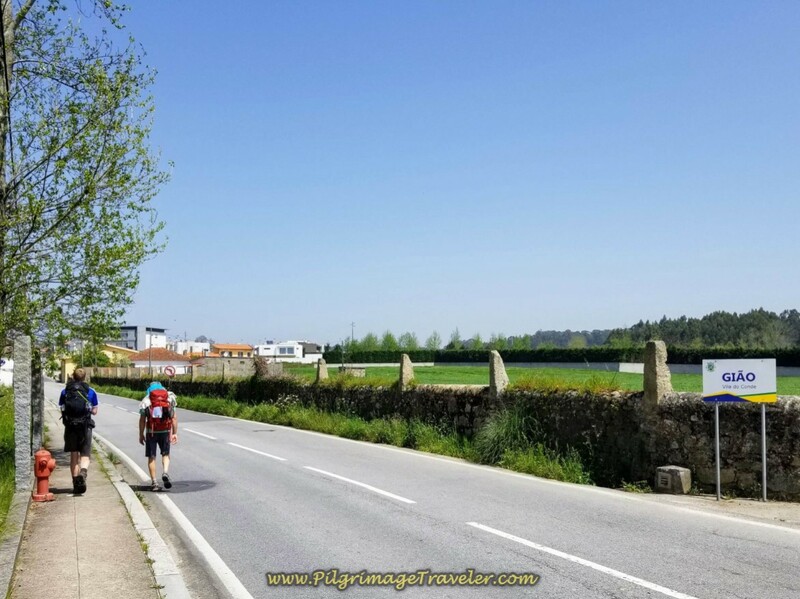 At this juncture you have only about 11 kilometers left on day fifteen of the Central Route on the Camino Portugués, so this may be another opportunity to buy groceries for your dinner, with not a lot of distance to carry it. 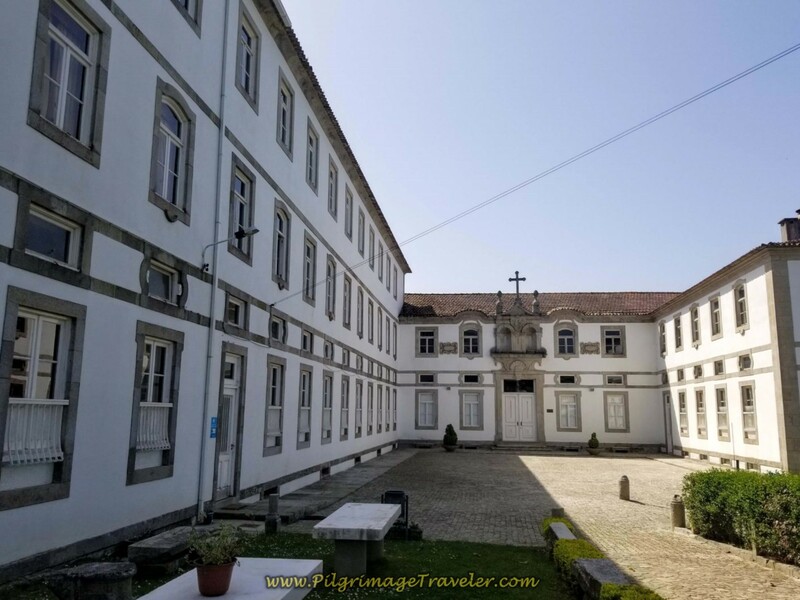 Especially if you plan to stay at the monastery of Vairão, which only has a very tiny market. 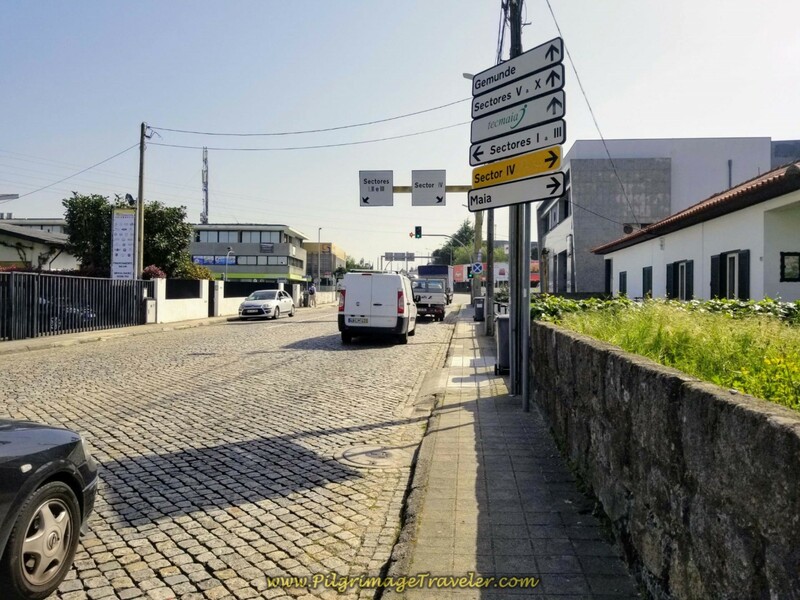 Take a right at the Lidl and continue your eastward ascent into the industrial zone of Moreira Maia. A large sign denotes your entrance into the industrial park. Walk only about 300 meters into the industrial park, a very, very busy place full of trucks, then turn left as directed on the first major intersection. After turning left off the main industrial street, start the second, nice downhill through the remaining section of the industrial park. All-in-all the industrial zone walking is only about one kilometer or so, and then soon, the Way is nice and rural and turns westward to walk towards the next town of Mosteiró. ...and very soon come to a conveniently located café, just before Mosteiró. 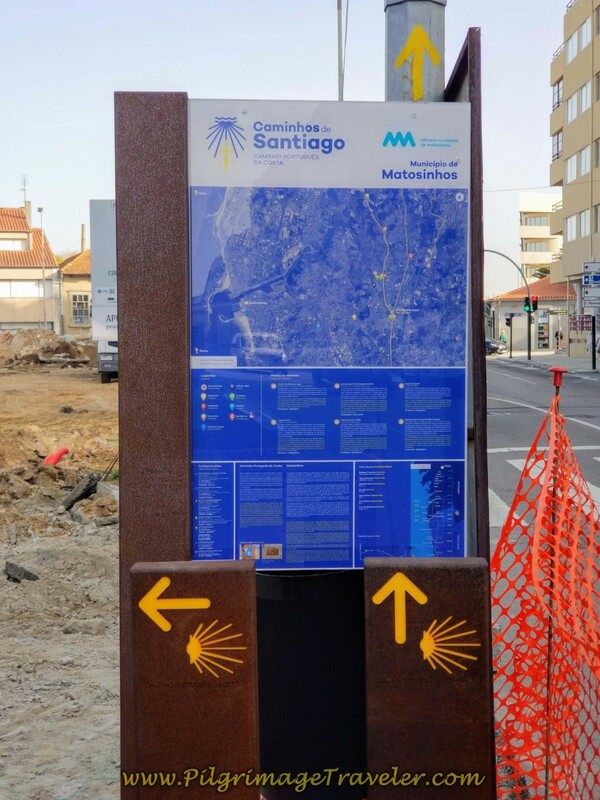 Come to the sign identifying that you have come to Mosteiró. 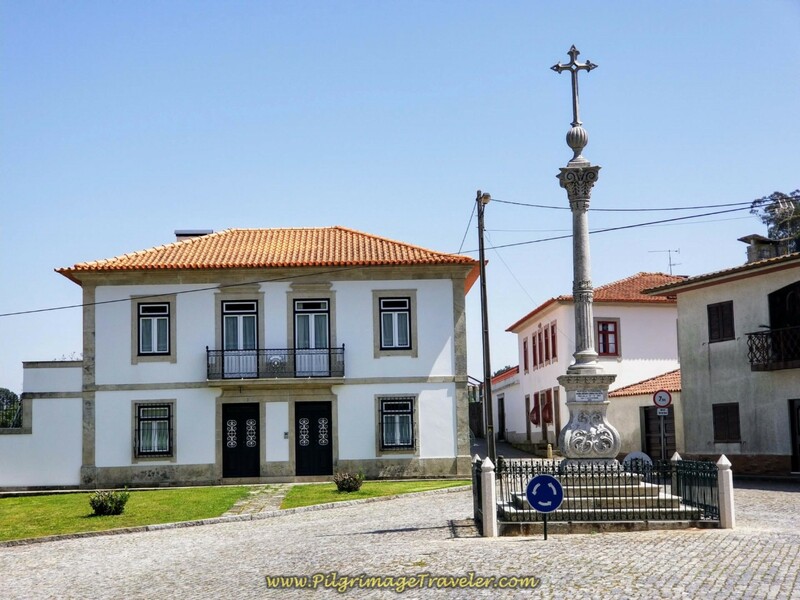 Walk through town and past the cruceiro in the center. After walking through town, continue walking on a cobblestone road for about another kilometer. This is Portuguese countryside at its best. 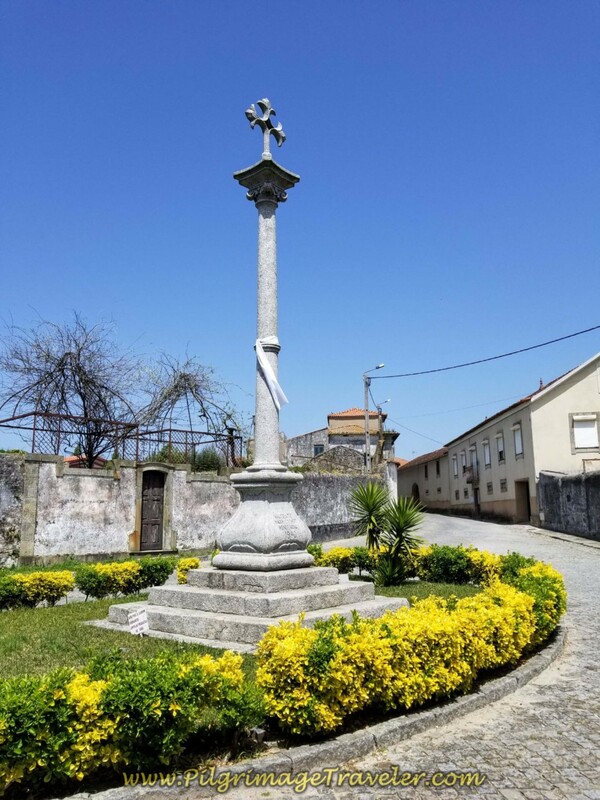 Enter the next town of Vilar and its cross at the center. 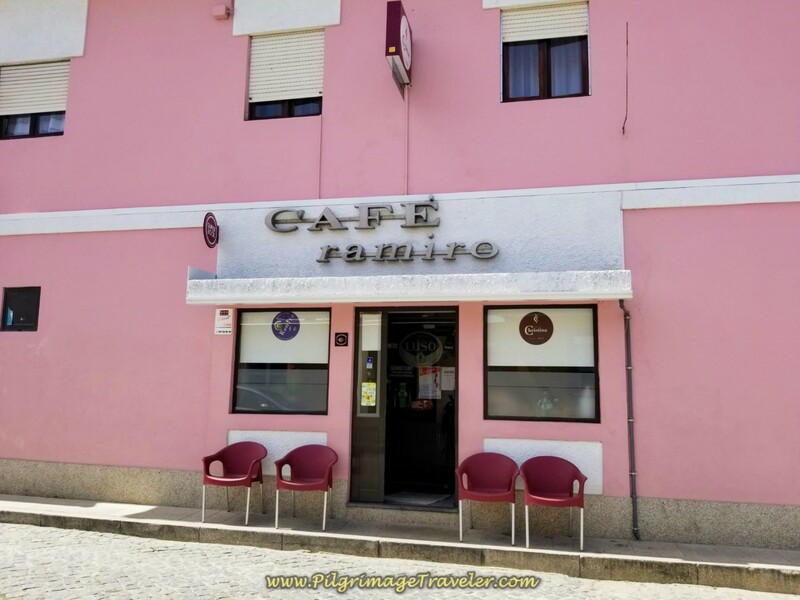 It was here in Vilar that we decided it was time for a lunch break and stopped at the bright pink Café Ramiro at 20.4 kilometers. The attached restaurant was bustling with those having lunch, while we sat in the bar and had a quick coffee and sandwiches. While we were sitting in the bar, a nice, tall young man smiled at us and we struck up a conversation. He was Magnus from Germany. He asked if he could join us on the walk, and of course, we said "yes! We had gathered one pilgrim. 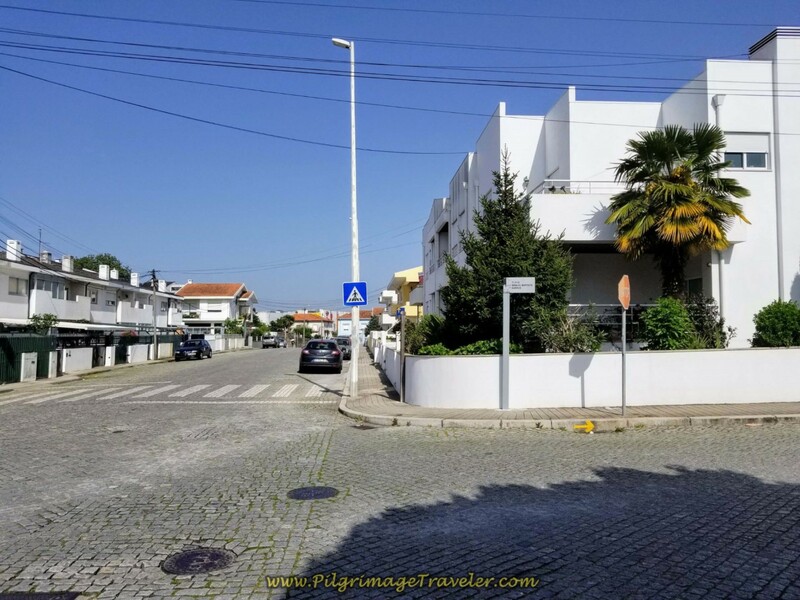 The day was quite hot as we three left the bar, cheerfully, having been told by the barman that we had only 6.0 kilometers to Vilarinho. 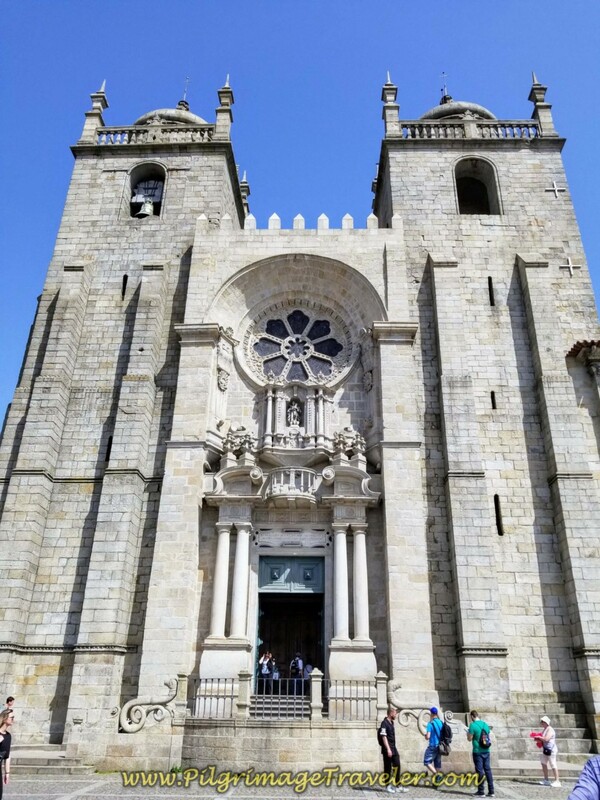 As it turned out, to our destination, the Mosteiro de Vairão, the monastery was only about five more! 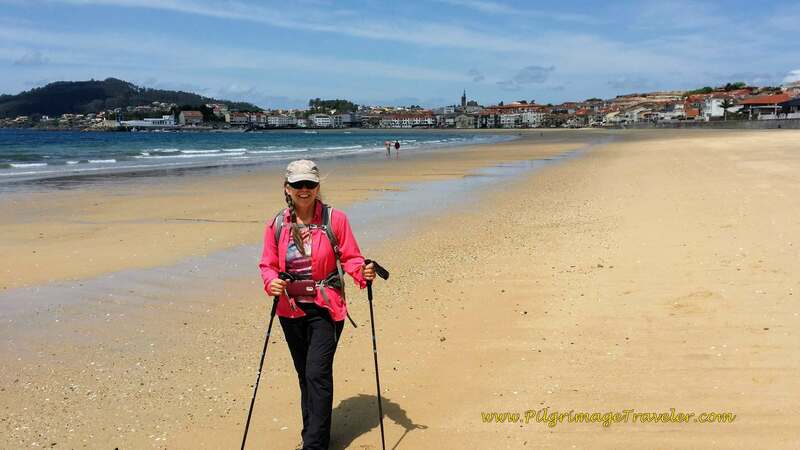 Shortly after Vilar, the Camino joins the N306, and walks northward. In most places the busier road has either sufficient shoulder to walk on safely, or sidewalk. 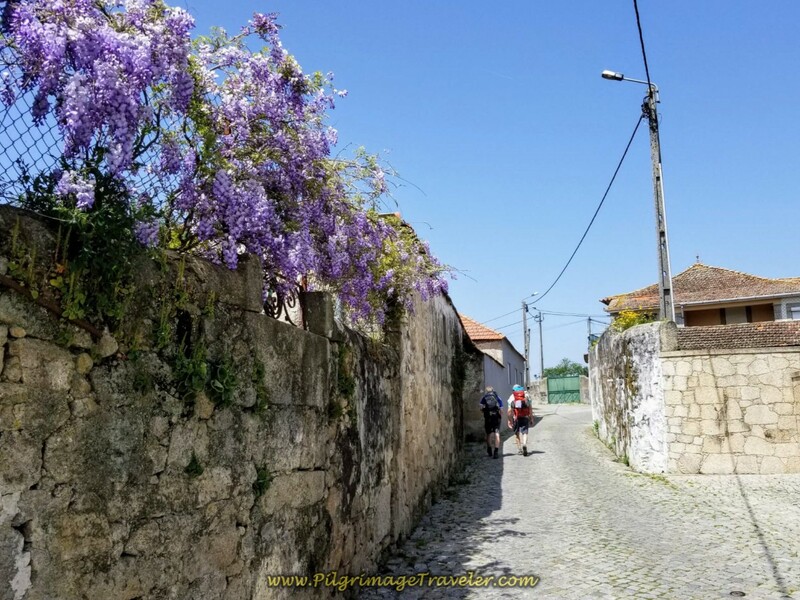 We walked on about one more kilometer to enter the village of Gião. There are cafés here as well if need be. In yet another kilometer or so, when entering the town of Joudina, we came to its main intersection and a decision point, below. 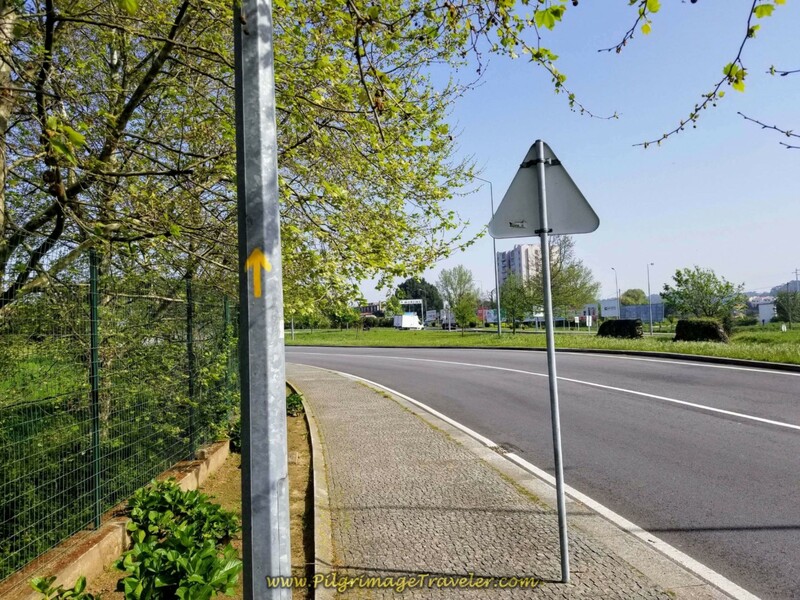 Here is where you must decide whether or not to go straight and continue on the N306 to walk directly into Vilarinho, or take the scenic route to the right to Vairão. Since we wanted to stay at the monastery, we turned right. 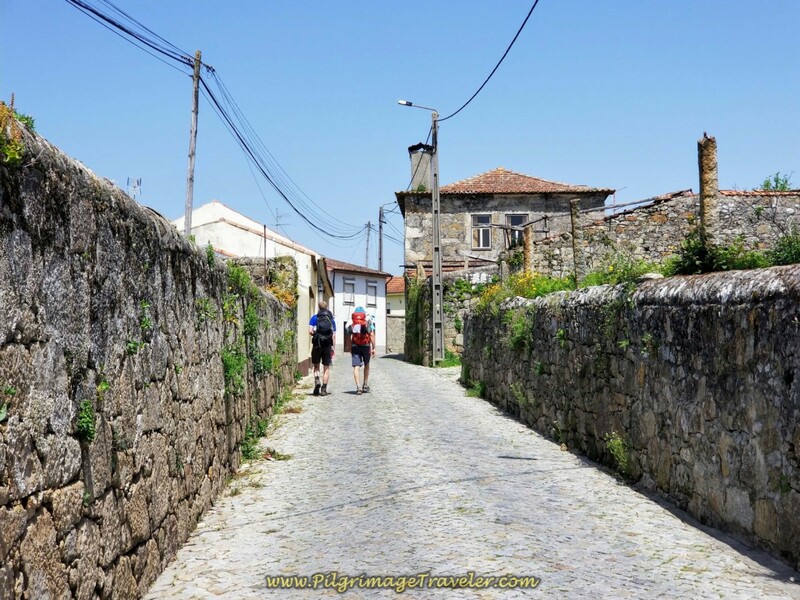 In less than 1/2 kilometer, the Camino goes to the left, by this beautiful cruceiro, below. If you look to the right you can see the beautiful church of Gião. The route on this diversion is quite charming as you can see, walking toward the next town of Tresval. The wisteria were magnificent and filled the air with a wonderful aroma. 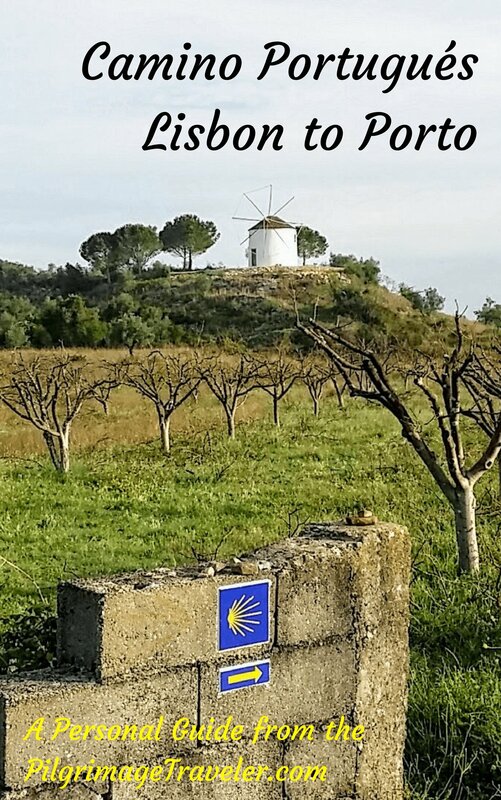 And then, the town sign of Vairão appeared. Just a little longer for today. The Camino takes a right turn at the town cross, below. 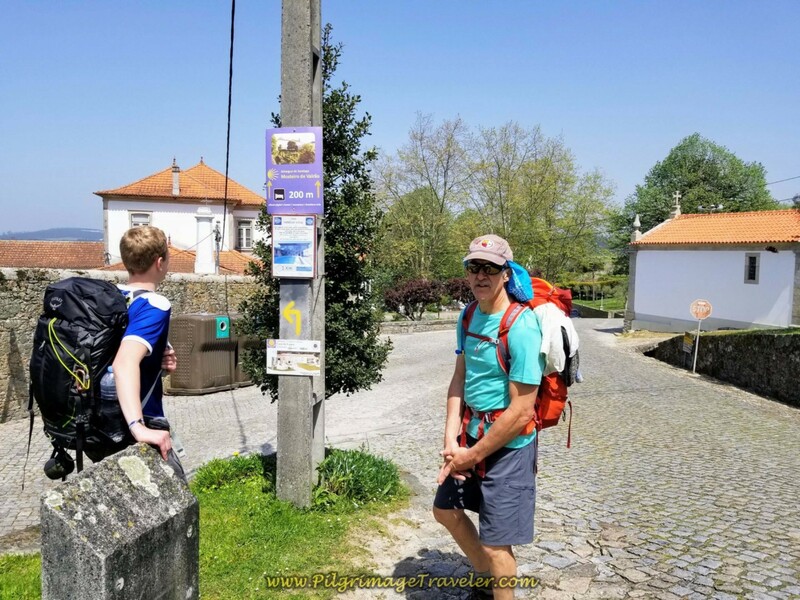 ...walking onward only 700 meters or so more, to the point where the Camino turns west (left) and back towards Vilarinho or onward by the small chapel to the Monastery albergue directly in front of you. We walked straight on and down the hill to the albergue which appeared shortly before us. 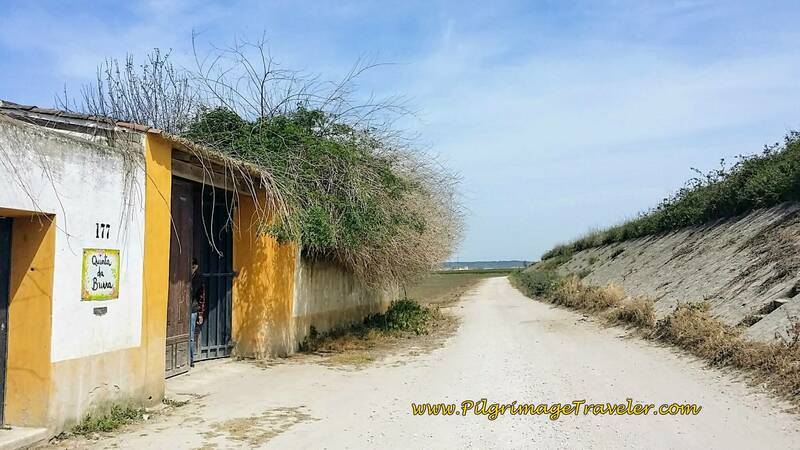 Here is the entrance gate to the albergue, farther on. The albergue entrance door is to the left, in the photo below. The reception is up on the 3rd floor after entering the building. I am not sure where the hospitalera waits, but suddenly she appeared to show us the place. 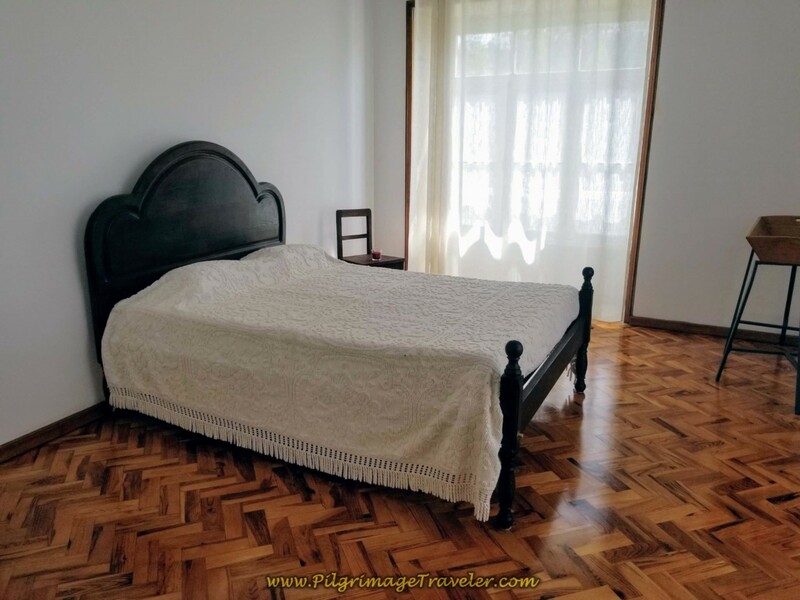 The albergue is enormous, on three floors total, with choices of various rooms, with a different number of beds in each. The rooms with six beds I believe were 5 Euros, those with four beds a bit more, but we chose the double-bedded room on the top floor, with real sheets for 20 Euro for the two of us. If you are a couple this is a deal! The bathrooms are all shared but with a room like this who cared? This is the view from our room! Mosteiro de Vairão is a wonderful place. 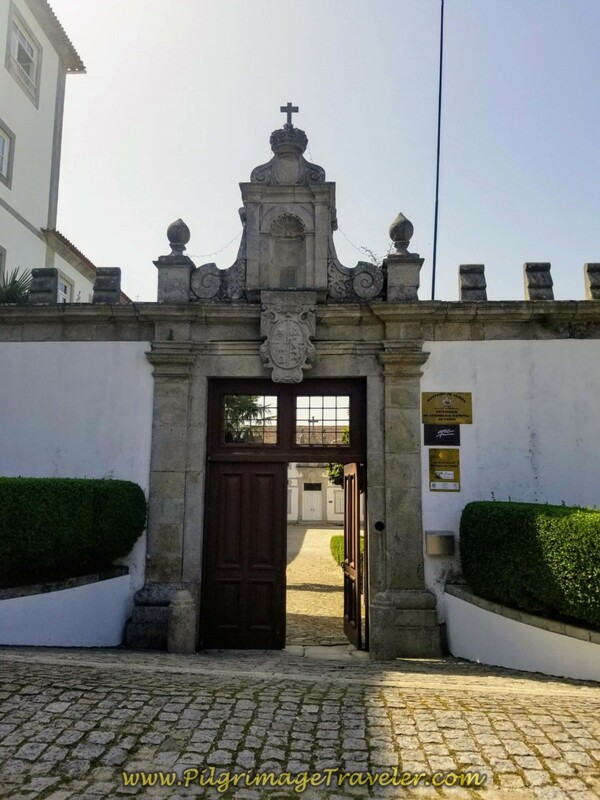 The Convento de São Bento, the church in the complex was not open, but the cemetery was. The inside gardens were also closed to pilgrims. Shortly after securing our beds and while we were hanging our laundry outside another young man came sauntering up to the albergue door. He introduced himself as Matt from Miami. We struck up a conversation and invited him to join us for dinner. We had collected our second pilgrim. After visiting the tiny supermarket next to the monastery, (see map above) we made a fabulous meal of wine and pasta tossed with turkey, carrots, zucchini and cheese. Interesting choice, I know, but we had to make what we could find at the tiny market. Matt, Magnus, Rich and I dined in style. We noticed few others were staying at the albergue that night. Where was everyone? 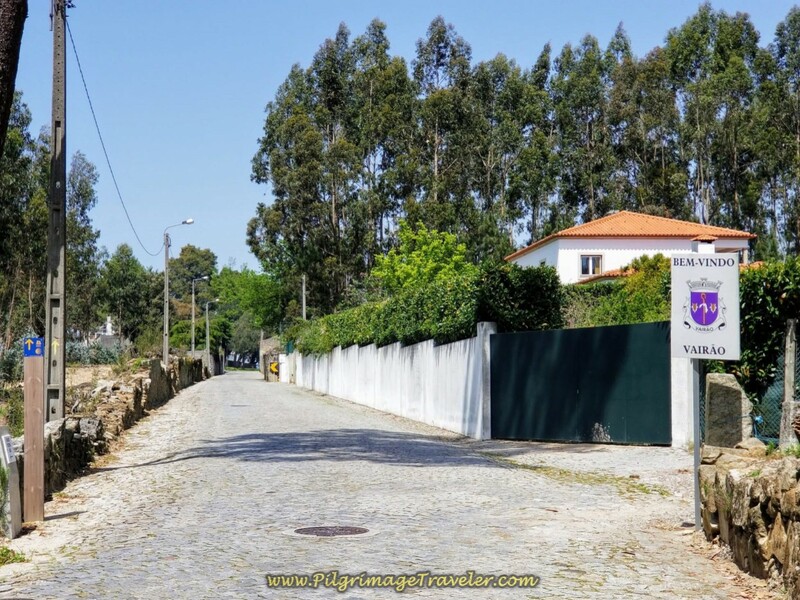 If you choose to go onward into Vilarinho, another 1.3 kilometers, there are two more places for accommodation, the Casa Familia Vidal Vilarinho and the Casa da Laura, both are right along the Camino, (see my map above). 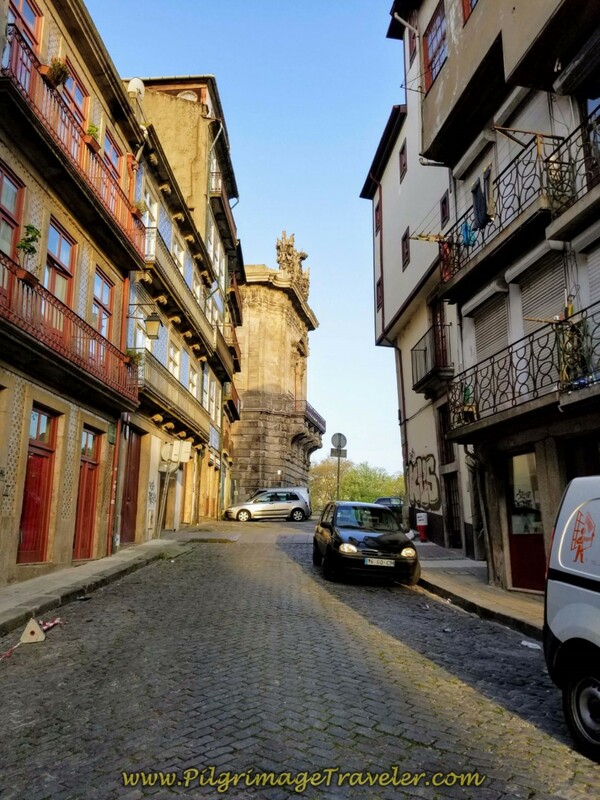 Our day fifteen on the Central Route was not all that interesting, nor that inspiring, but it was an enjoyable first day out of Porto. 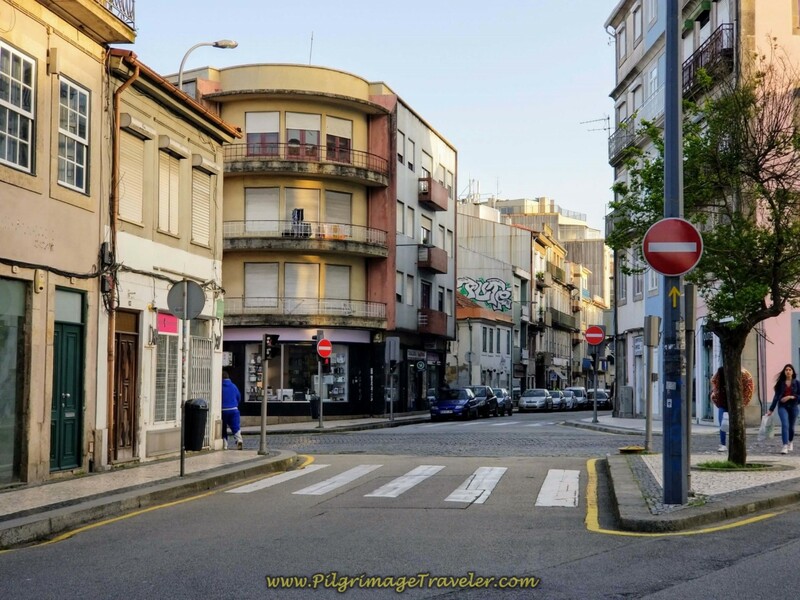 Portugal is quaint regardless of the area, and I didn't mind walking through the urban areas at all. It may be harder on the feet with the pavement, but all the sights and distractions are easy on the mind. Not to mention the many services and cafés that are available to the pilgrim. Our morning was essentially a solitary walk together, but then as the day progressed, the usual collection of pilgrims was unfolding. However, this time was different, and we were soon to understand why. Our purpose for this day was to gather young, strong men. If we only knew! Why did I chose the opening quote? 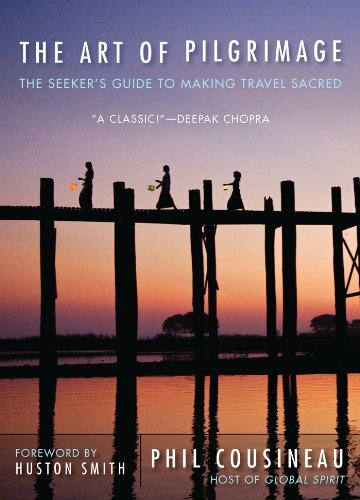 "I am you and you are I, and in whatever place you are, I am there, and I am sown in everything. And in whatever place you wish, you may gather me, but when you gather me, you gather yourself." Indeed God was here. 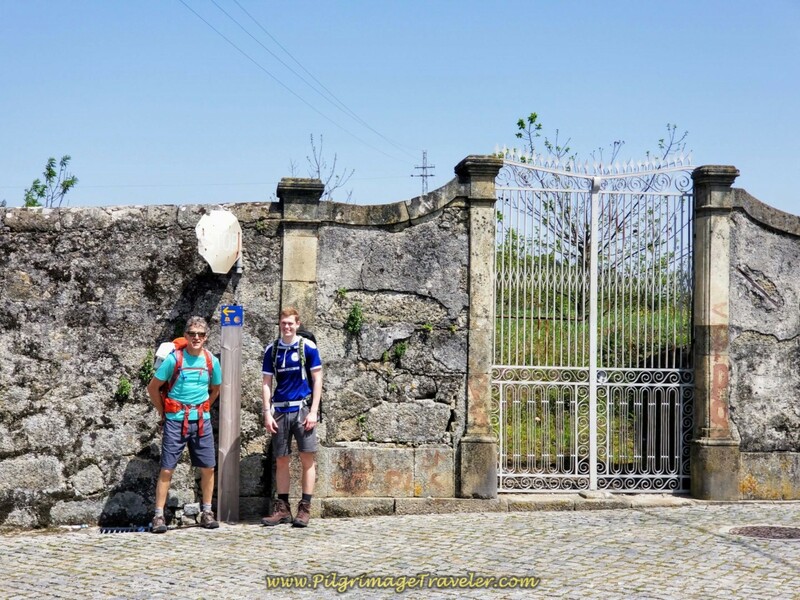 We were attracting these young, strong men to help us, to gather to us our purpose for our Portuguese Camino on the Central Route, on this day fifteen. And by doing so, we were gathering God. 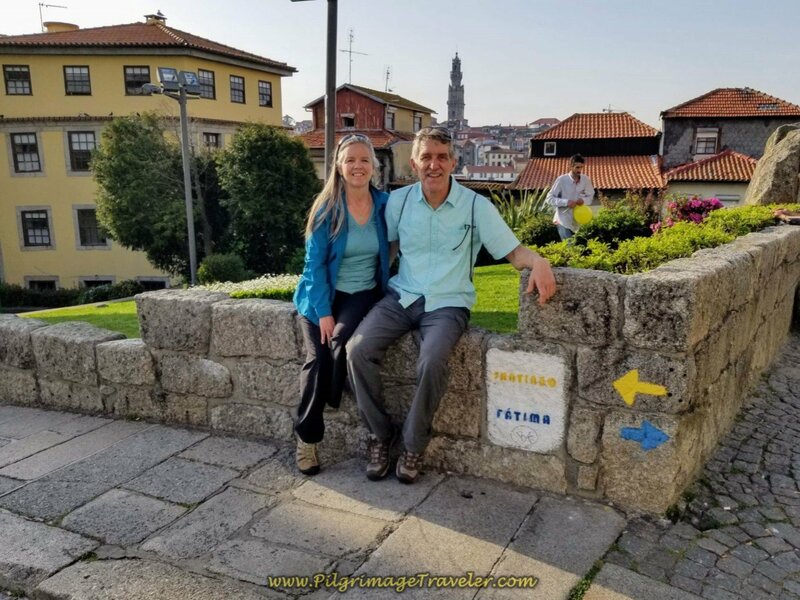 May your own day fifteen on the Central Route of the Camino Portugués be filled with God-Energy, meeting those whom you need and those who need you. Read on!